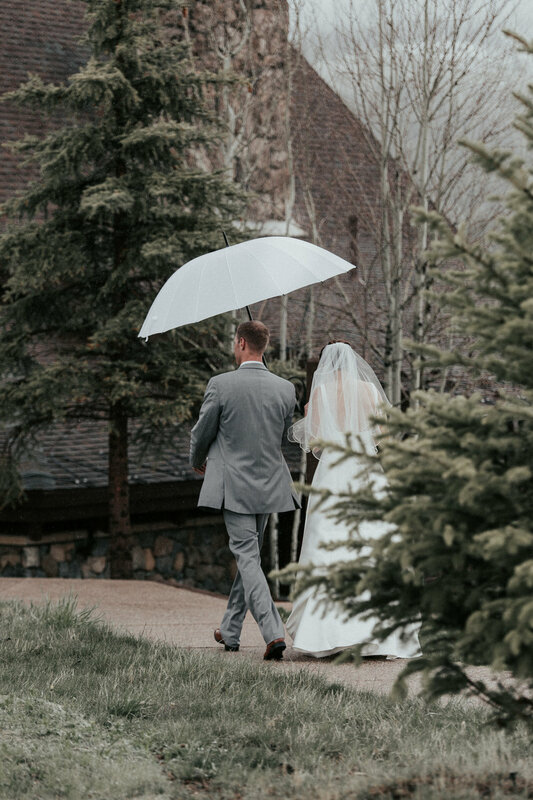 We always tell our couples that you can never predict Colorado's weather... Allison and Tony Learned the first hand when we woke up the morning of their wedding to see a full on blizzard, at the end of May. 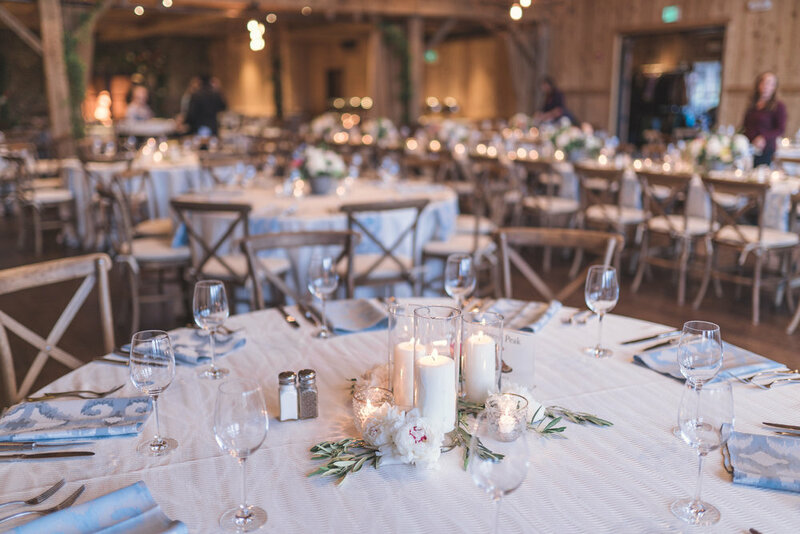 Needless to say they rolled with the punches as we transformed the inside of High Lonesome Barn into the perfect spot for a cozy winter wedding. 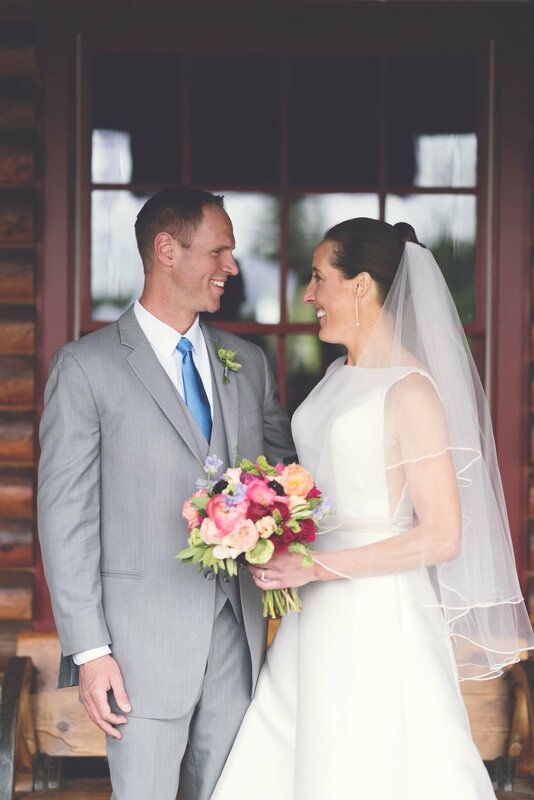 These two families has such great spirits despite the weather, laughing the entire day and soaking up the love. 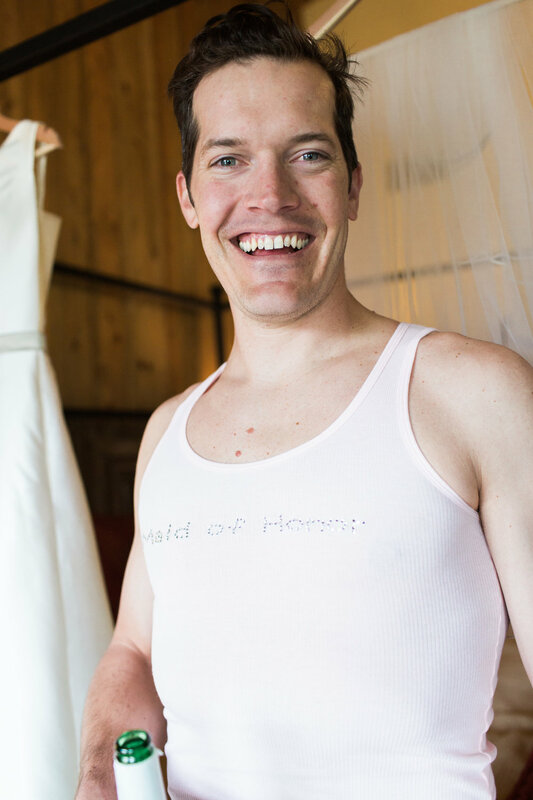 One of our favorite parts the day was when we walked in to see the brides two brothers wearing bridesmaids shirts and helping her get dressed! 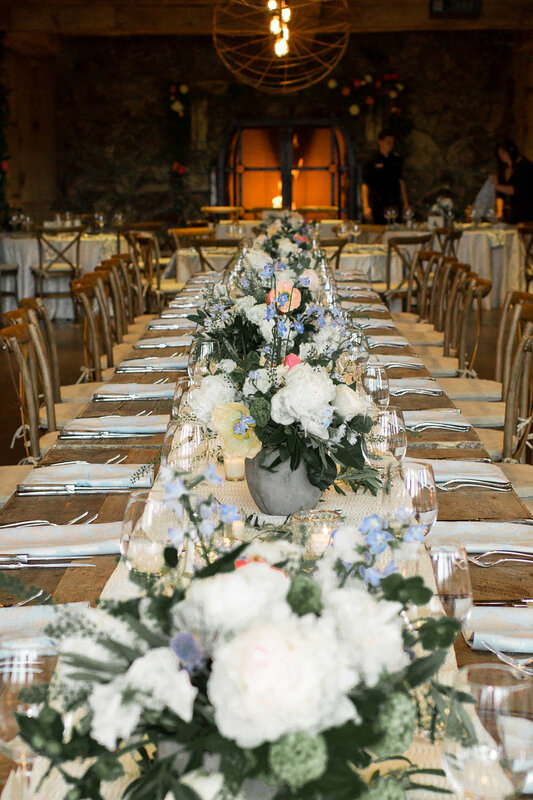 We decided to keep the florals and decor very neutral to highlight the beautiful venue. 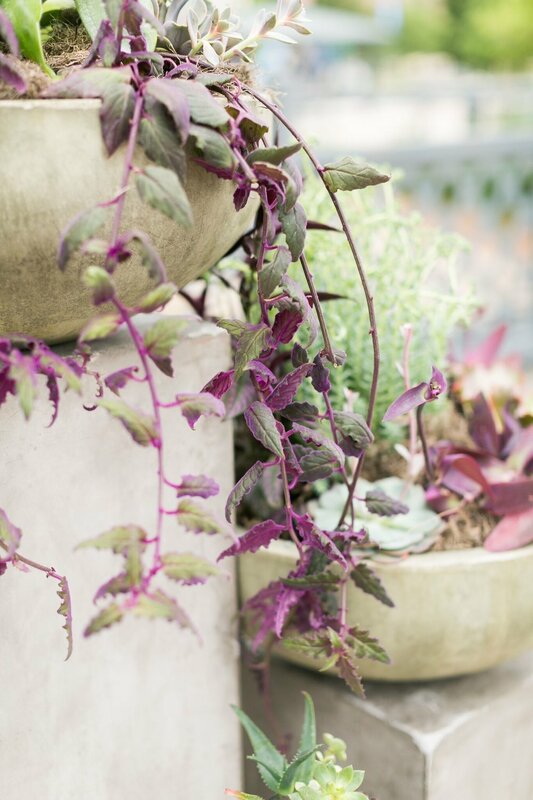 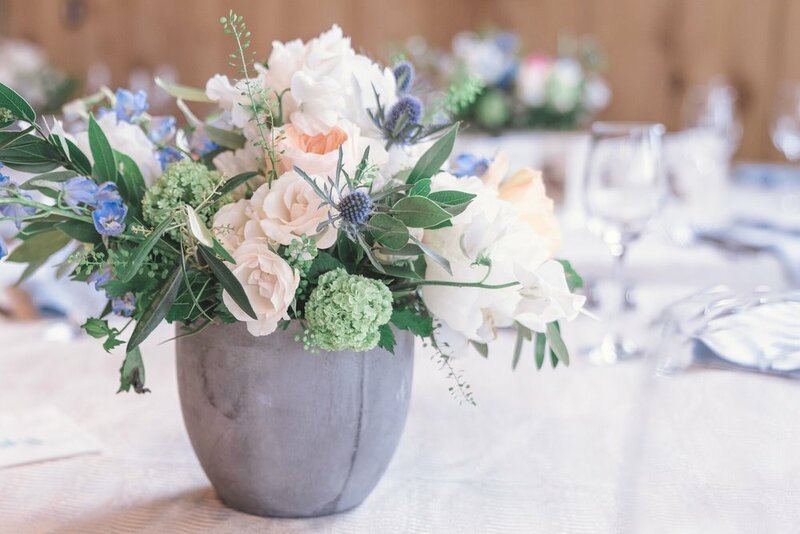 We paired soft and abundant blooms with concrete vases and rod iron chandeliers. 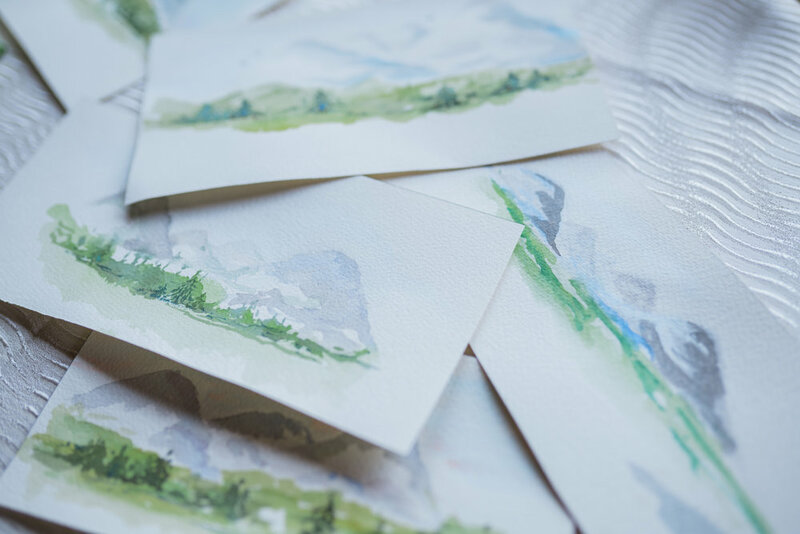 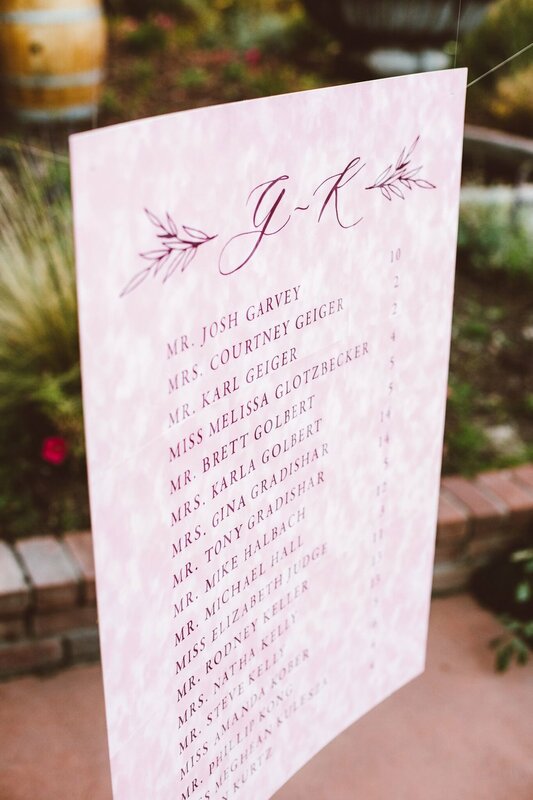 One of our other favorite details was that the brides mom painted all of the table names and the artwork that appeared in their invitations and programs. 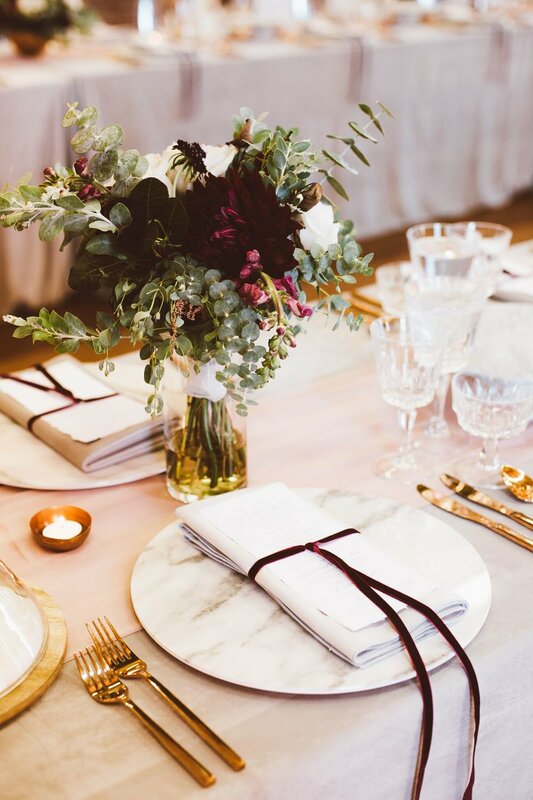 What says fall better then a rich color palette and lots and lots of velvet? 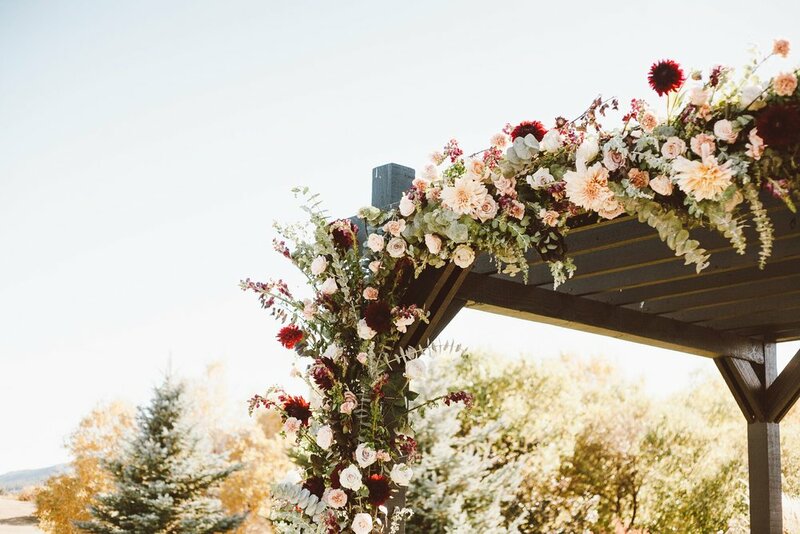 This wedding was a dream to design! 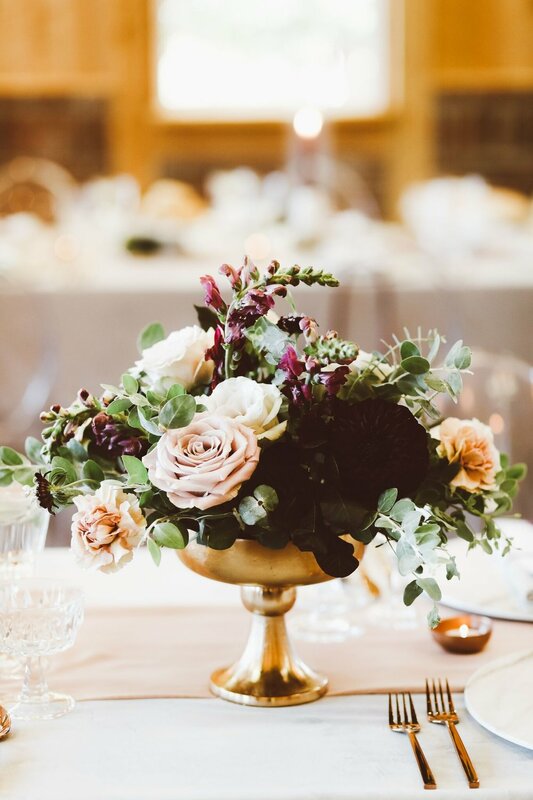 Every detail was executed brilliantly by an amazing vendor team bringing this romantic fall wedding to life. 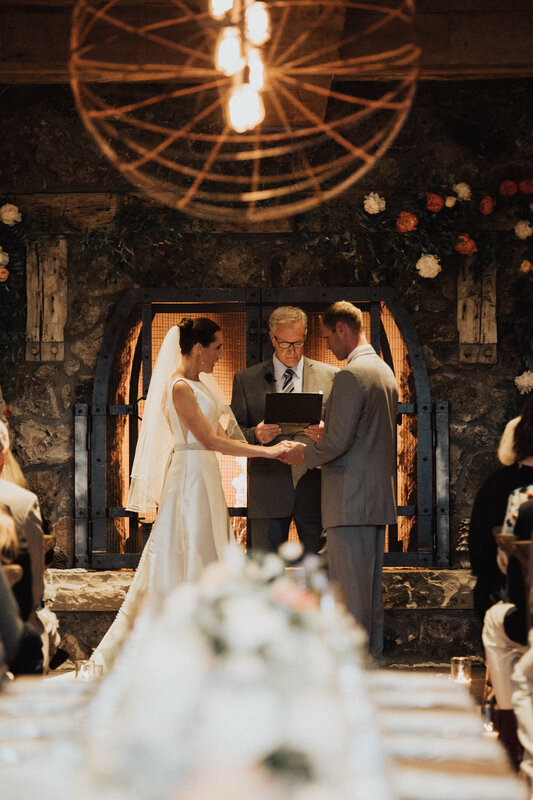 We love to think outside the box and this wedding definitely showed that, from a hanging velvet seating chart, custom eddison bulb lighting with copper cages, to marble chargers, everything for this wedding was 100% customized for the bride and groom. 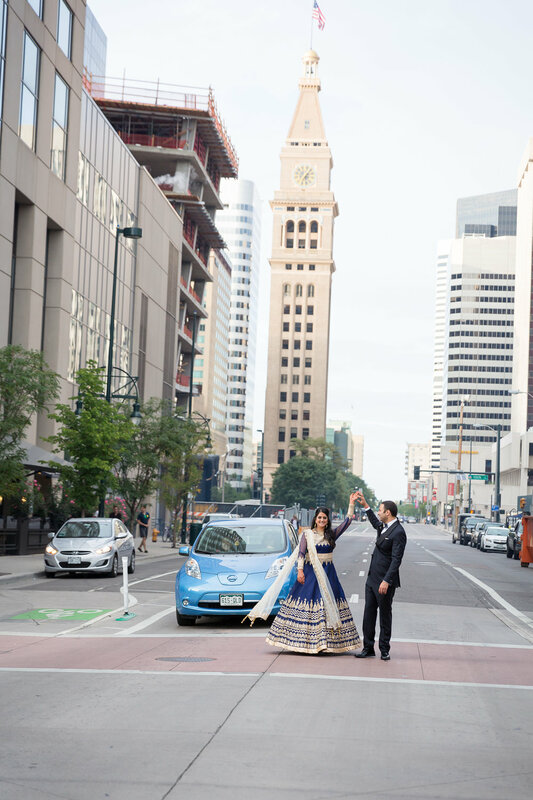 We will let the images speak for themselves. 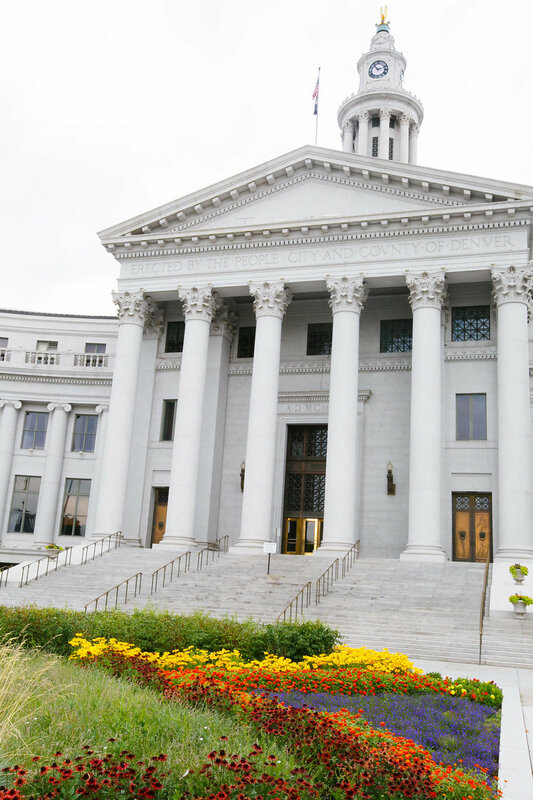 We are so lucky to work in such a beautiful state. 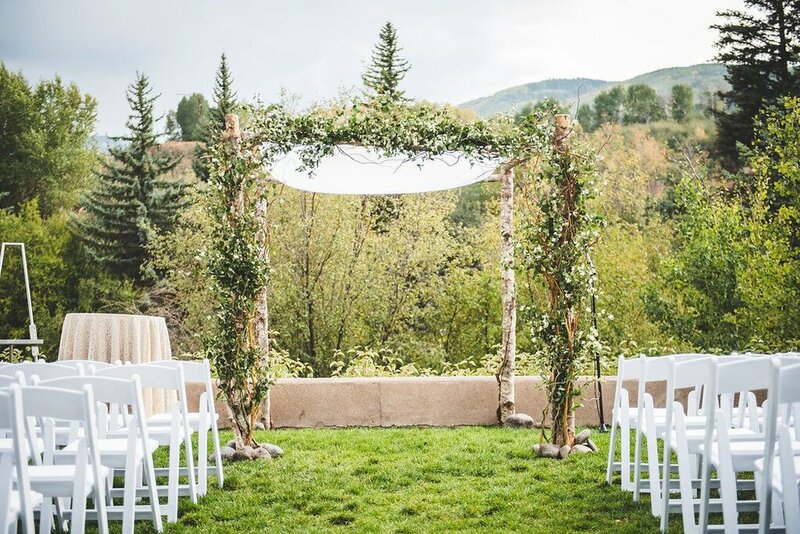 Every chance we get when designing a wedding we let the natural beauty of Colorado shine. 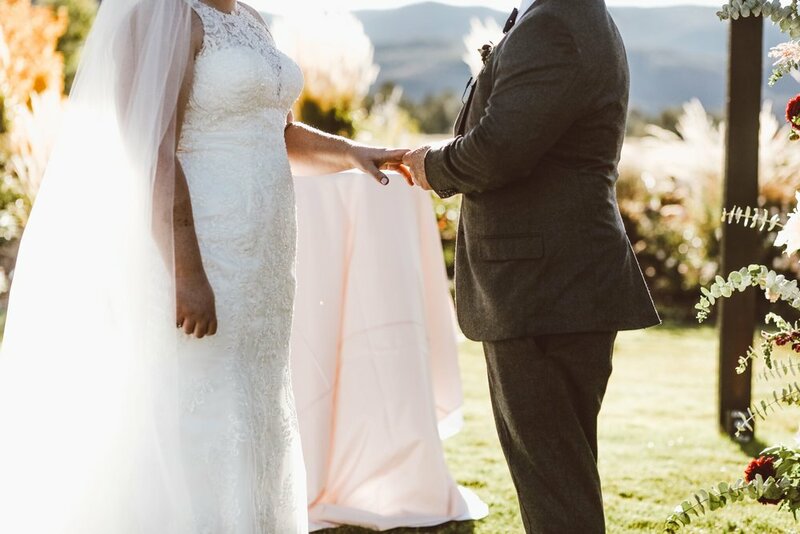 This elegant mountain wedding did just that! 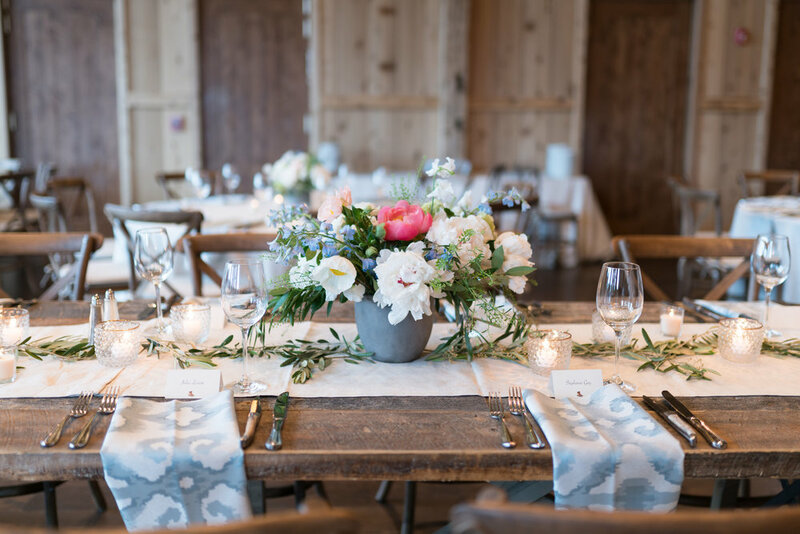 Lush florals complimented the stunning ceremony site and community tables gave an intimate feel for guests at Allison and David's destination wedding. 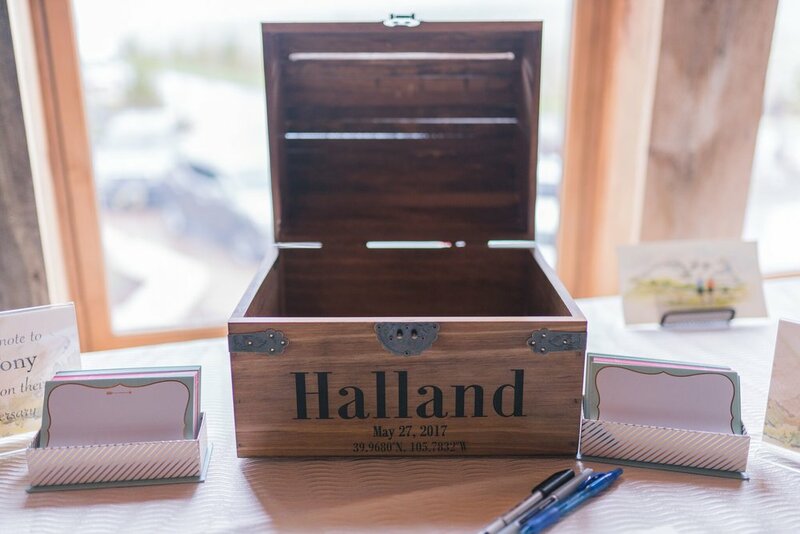 One of our favorite details were the chocolates at every place setting from Piece, Love, Chocolate. 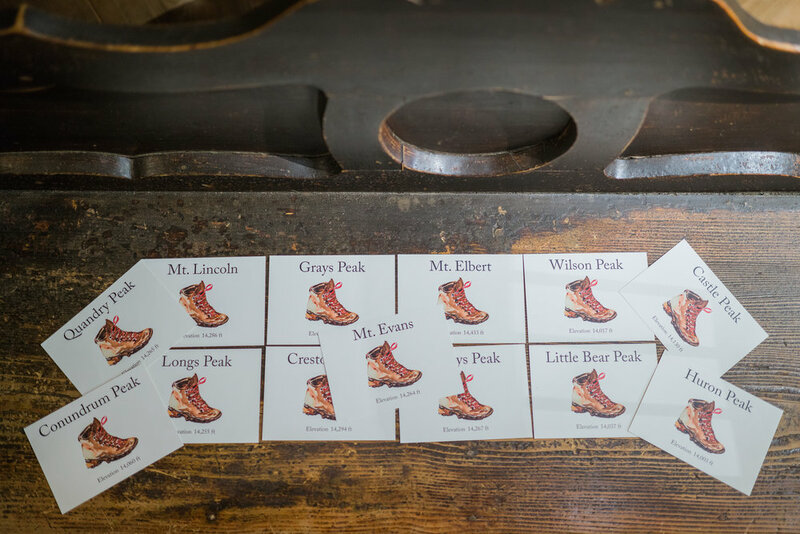 We especially love the little buffalo chocolate, Go Buffs! 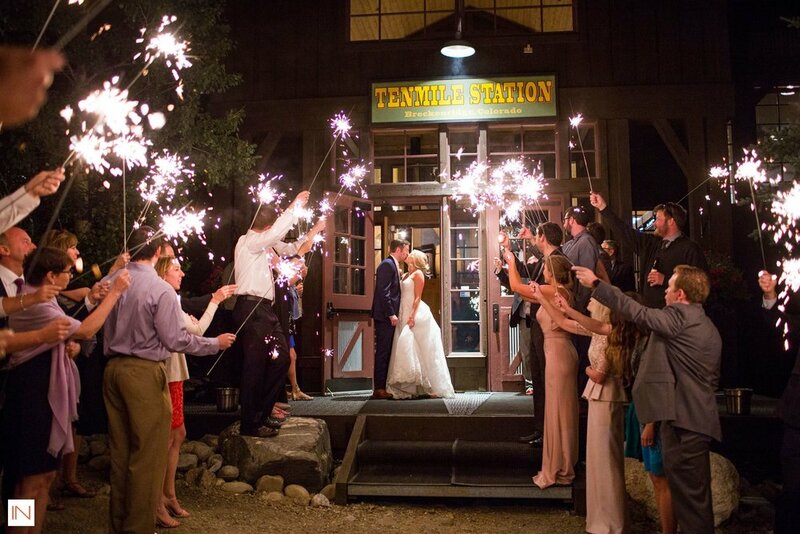 Guests danced the night away to amazing music and sent the bride and groom off in style with a sparkler exit! 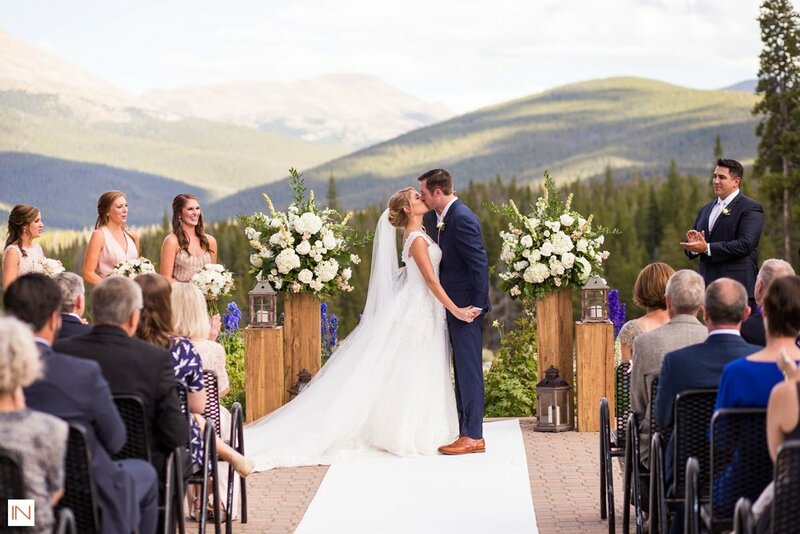 It was the perfect Mountain top wedding in Breckenridge! 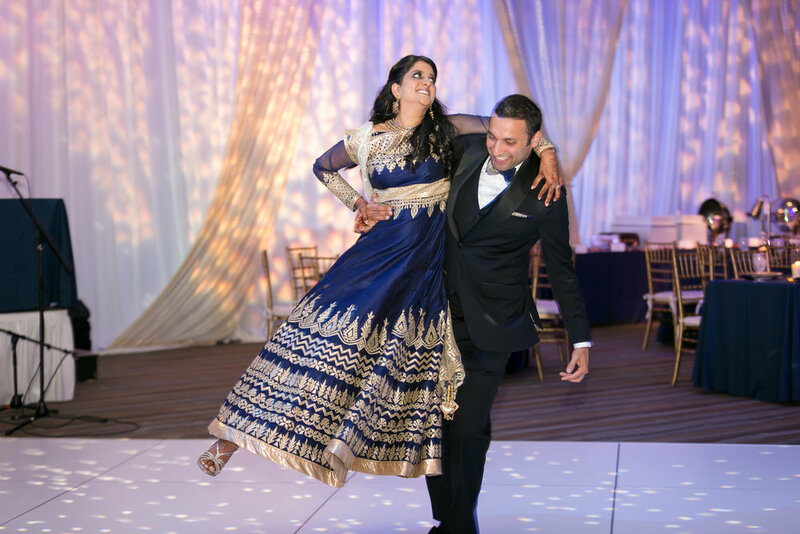 Every once in a while we come across a couple who shares an incredible sense of adventure in life and when we do, the results are magical. 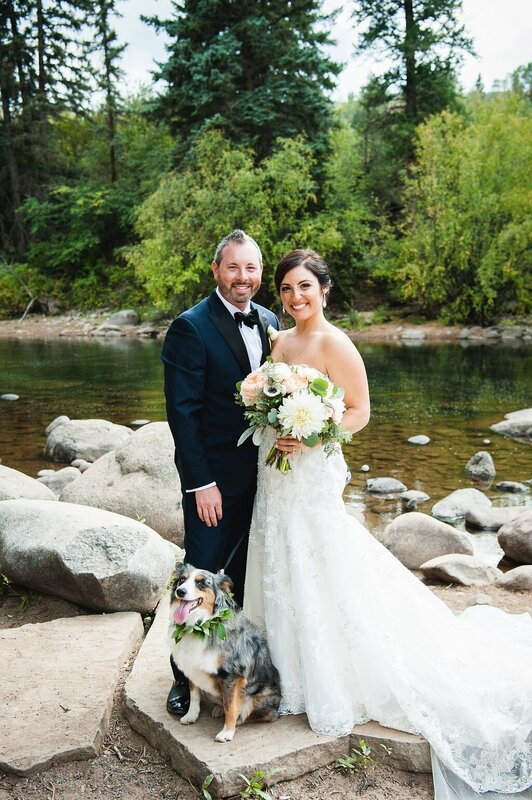 Ali and Rick spend most of their time rock climbing, hiking and enjoying this beautiful state, Colorado. 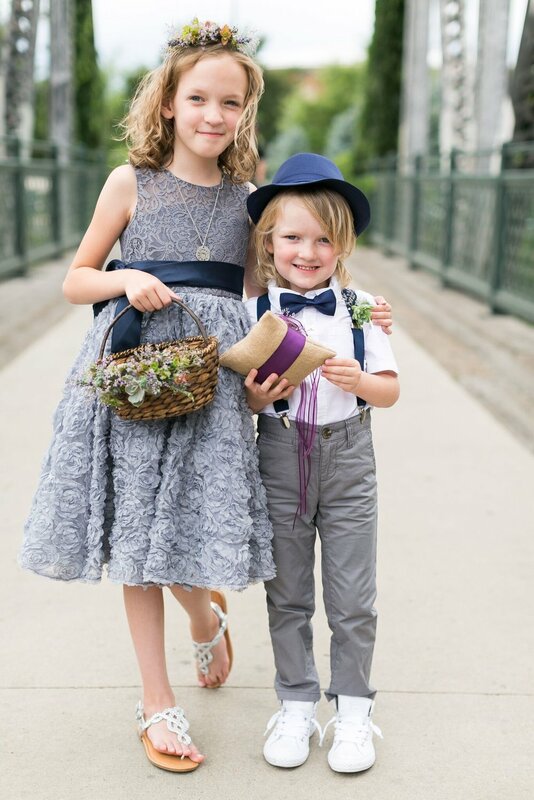 It was no surprise, when we asked them to walk in the river for photos, they were game! 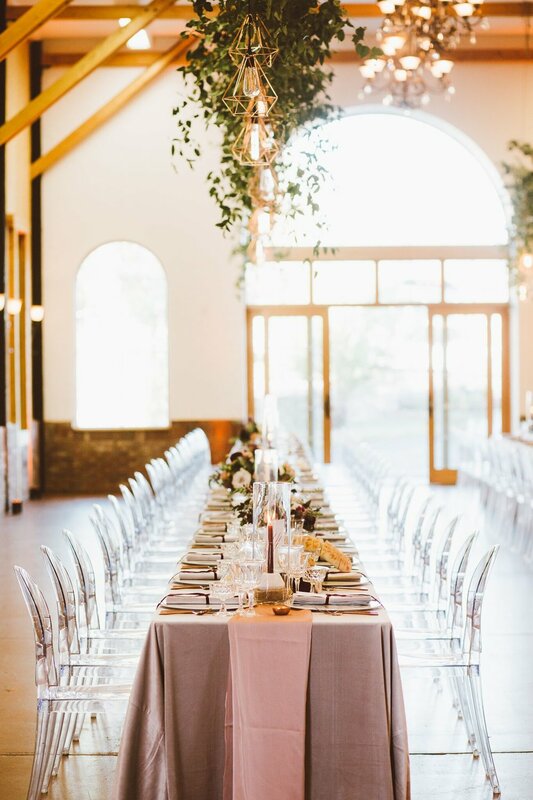 We had a little fun with the design of this wedding by bring in an unexpected modern twist with geometric vases paired with drift wood and super modern napkins. 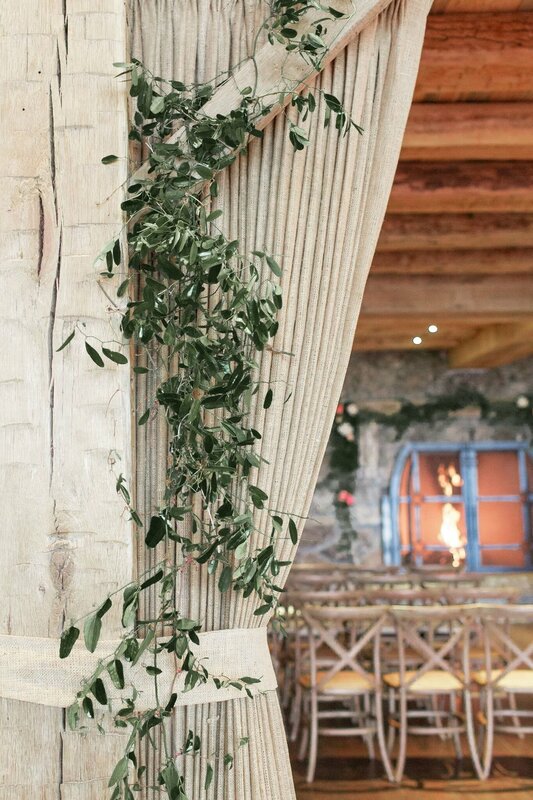 We love how this rustic/modern design came to life! 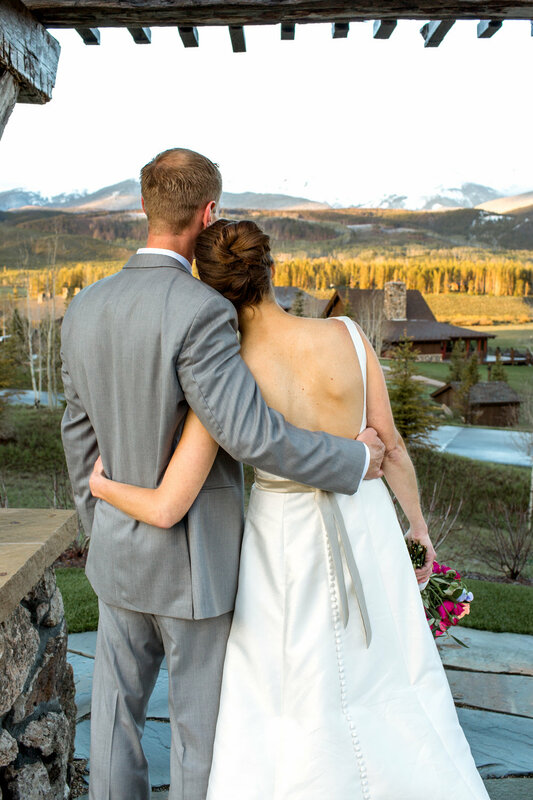 Man do we LOVE Piney River Ranch, you just can't beat that view! 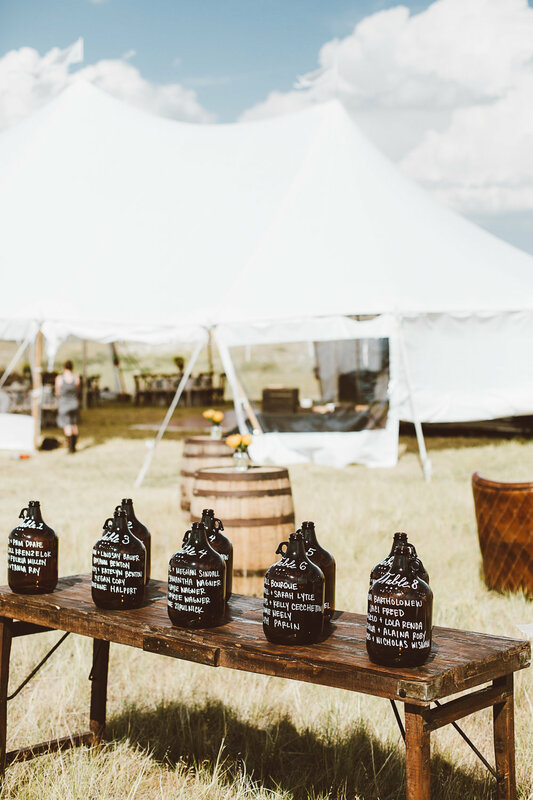 We had the opportunity to bring a little glam to this rustic mountain venue. 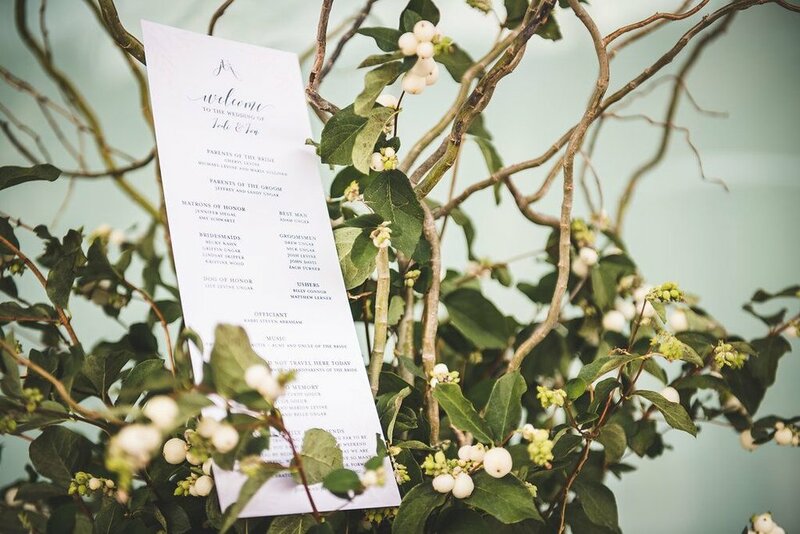 Lush green garlands framed the ceremony space perfectly while the wedding parties rich navy blue created the perfect contrast to the green forest surrounding. 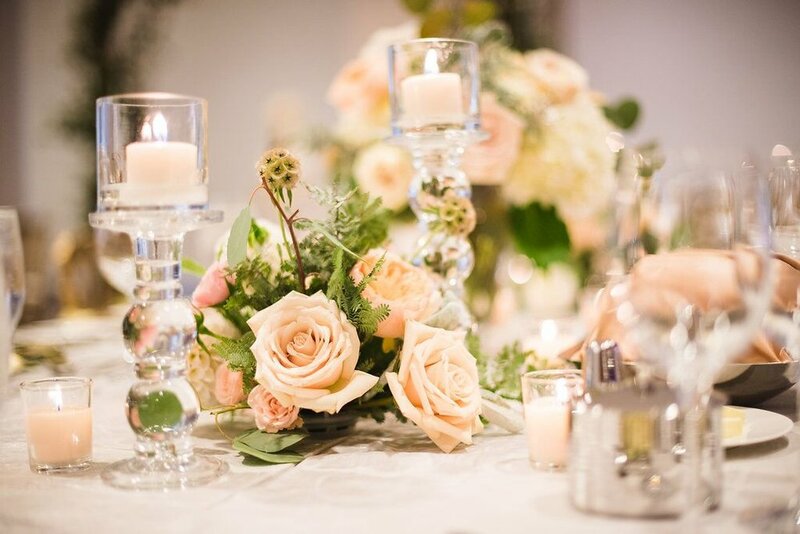 Lots of candle light and greenery set the scene for a romantic affair in the mountains. 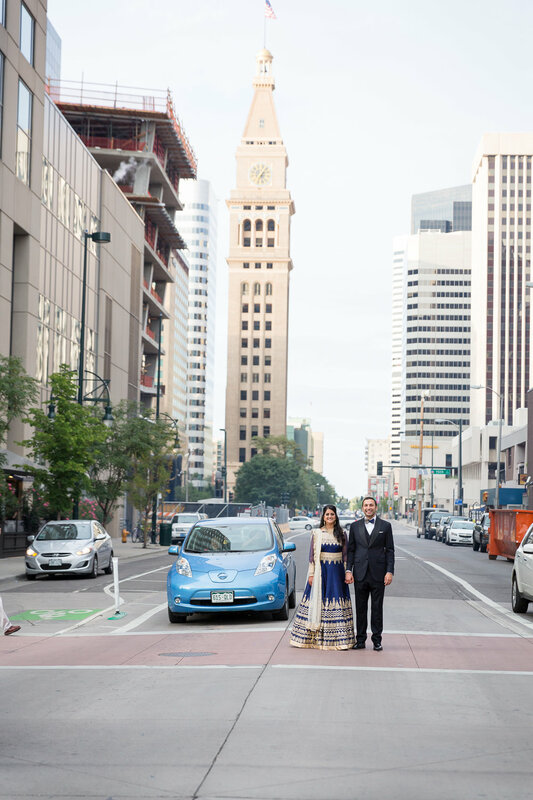 We loved this couple so much we even got in a kayak to paddle the photographer around the lake to get the perfect photo. 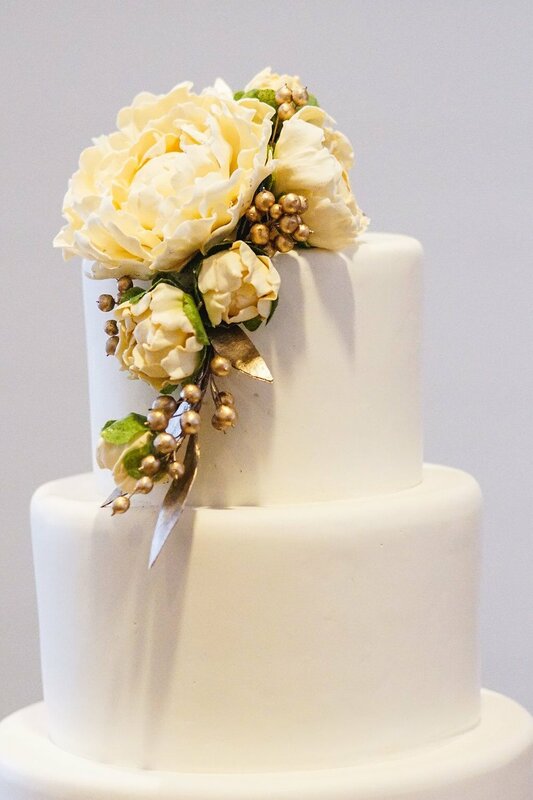 As seen in BRIDES. 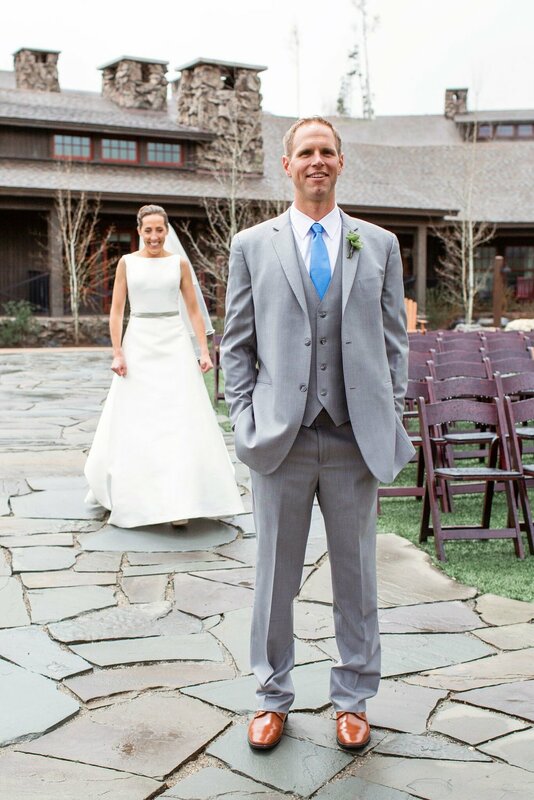 Beaver Creek has always been a special place for these two. 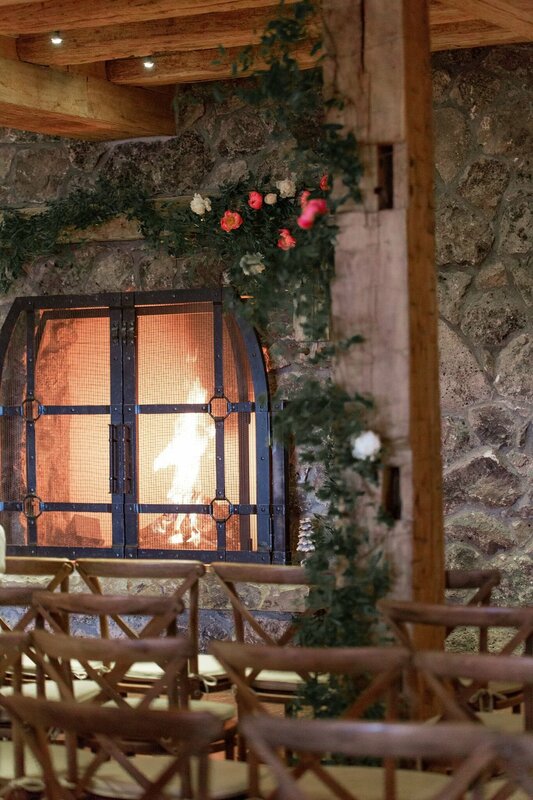 It is where they spend pretty much every weekend skiing and was the perfect place for Jon to Propose. 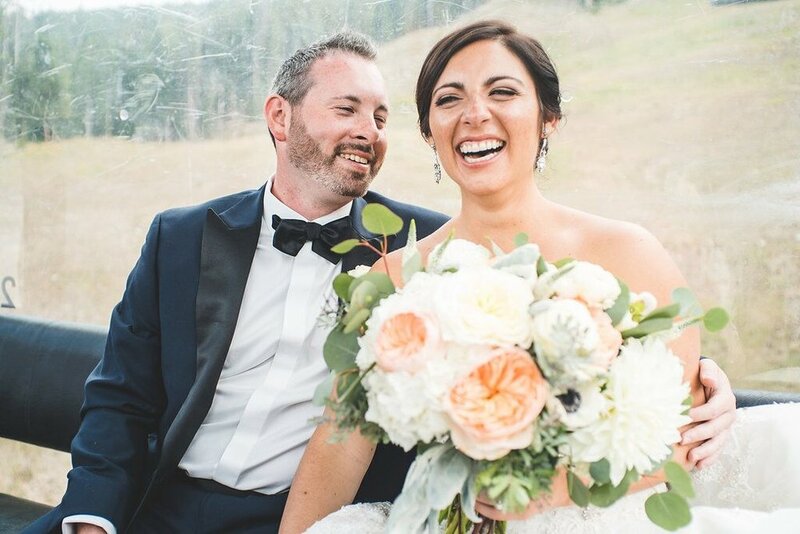 So, naturally Jodi and Jon wanted an elegant mountain wedding in Beaver Creek and man did they get just that! 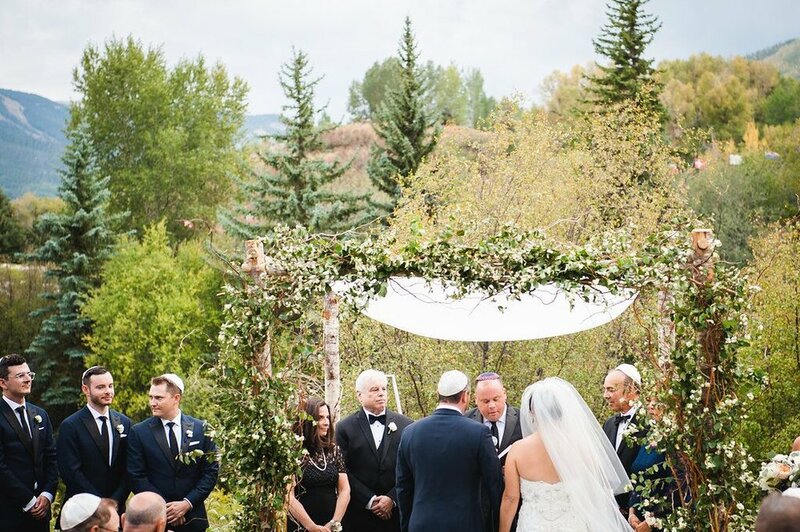 We wanted the Chuppah to enhance the beautiful ceremony location and not detract from the gorgeous landscape, so we kept it simple by covering it in tons of greenery. 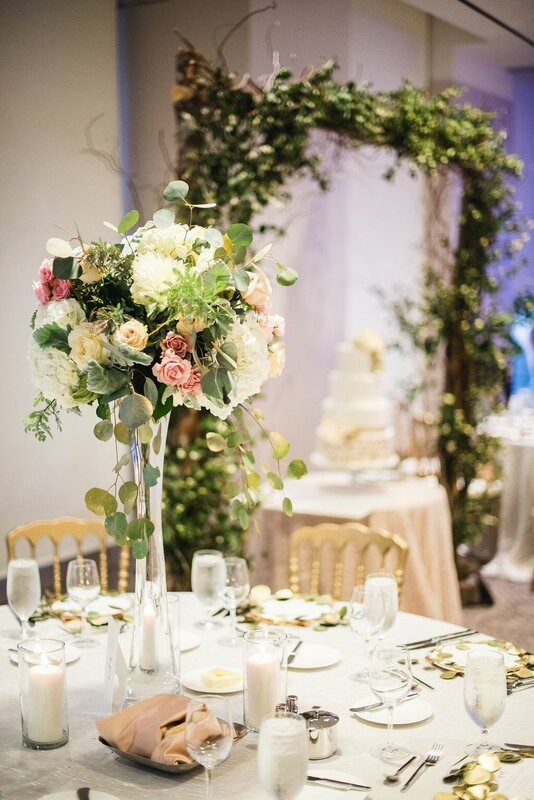 When guests entered the ballroom for the reception, they were greeted with luscious tall blooms and gold eucalyptus leaves. 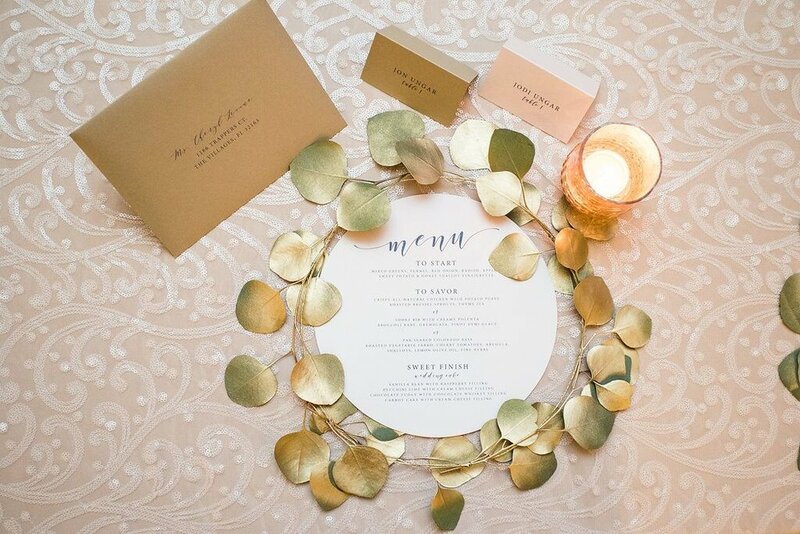 We always try and do things a little differently, so we used gold eucalyptus leaves as charger around an ombre water color menu. 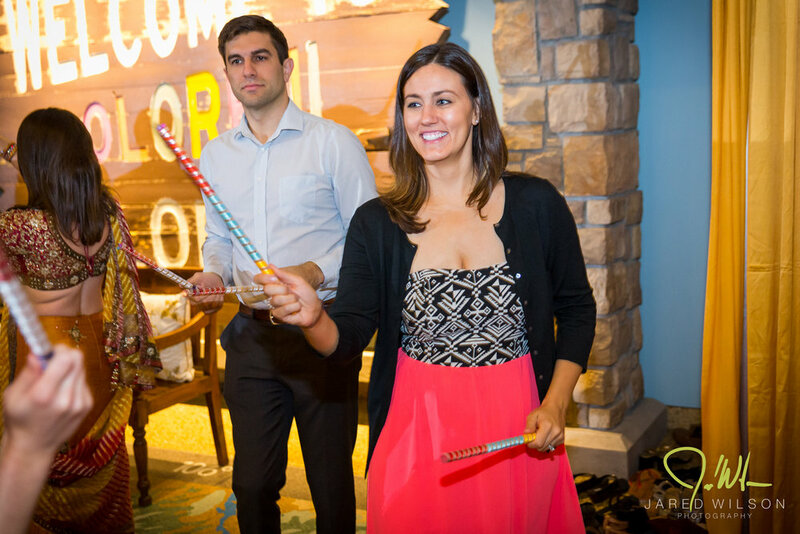 Candle light filled the room and candy was falling from the ceiling (literally with our hanging candy bar). 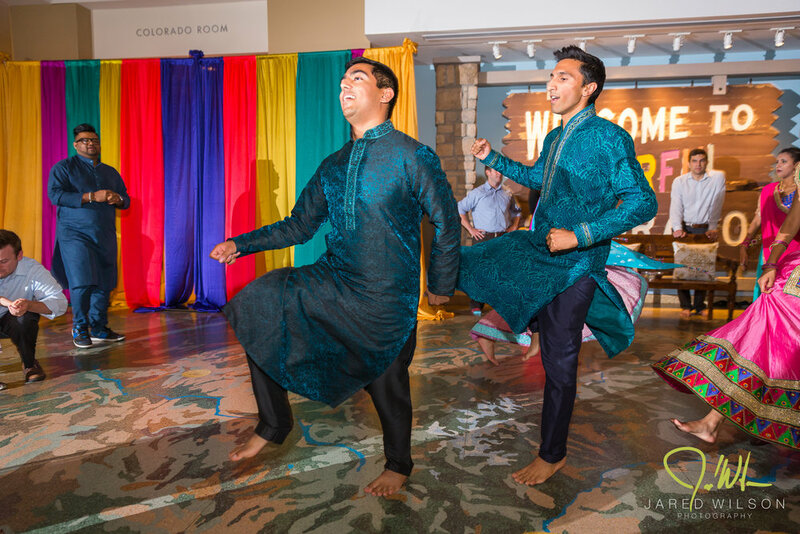 Guests danced all night long to the amazing talents of Funkiphino! 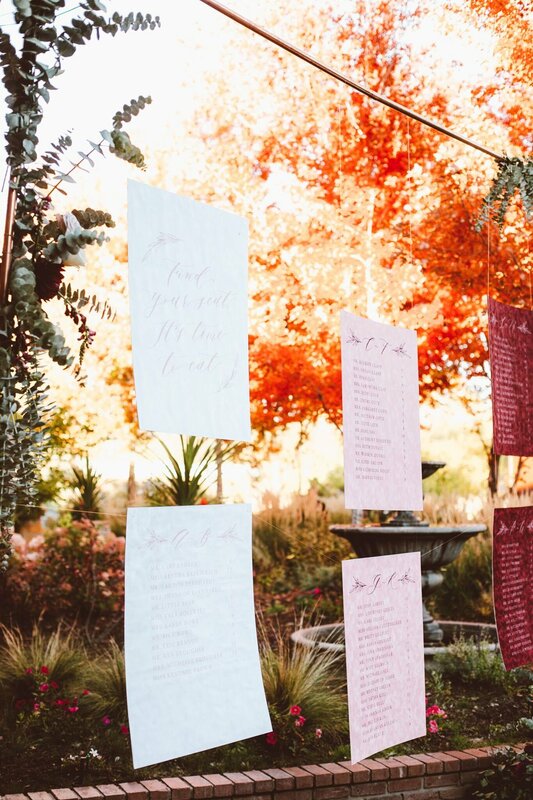 It was such a gorgeous evening filled with so many detailed elements! 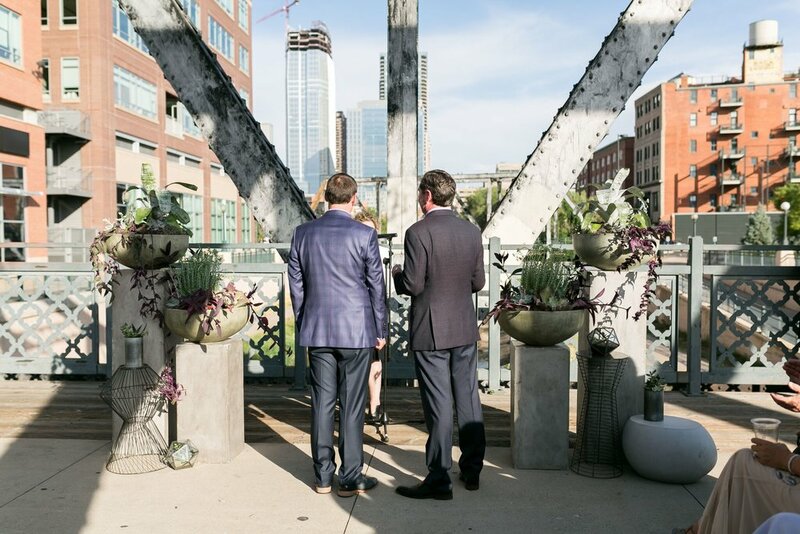 We love to transform a space and boy did we have fun turning this historic bridge into the perfect spot for a beautiful wedding. 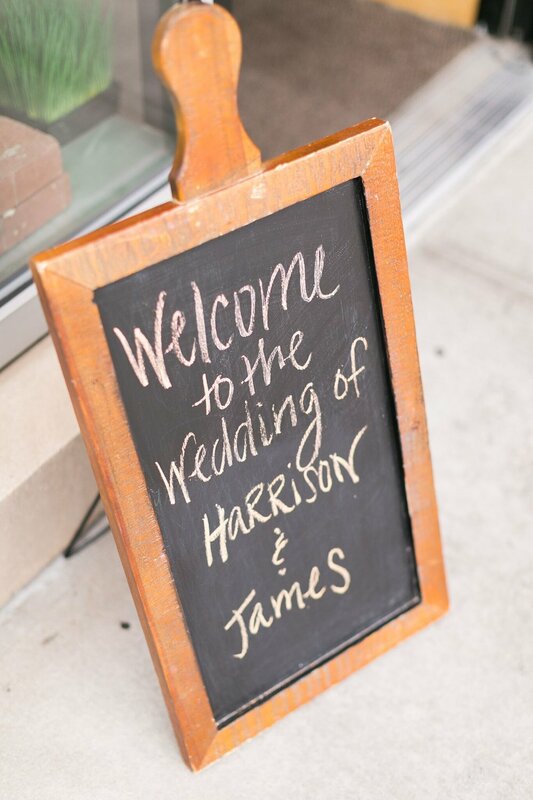 James and Harrison came to us after they had booked the Coohills bridge for their wedding. 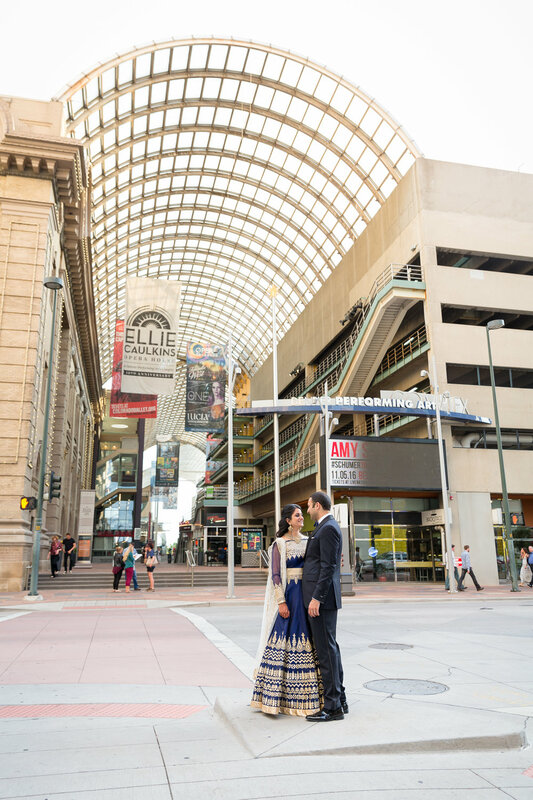 They loved the architecture and uniqueness but didn't quite know how to turn it into a reception venue. 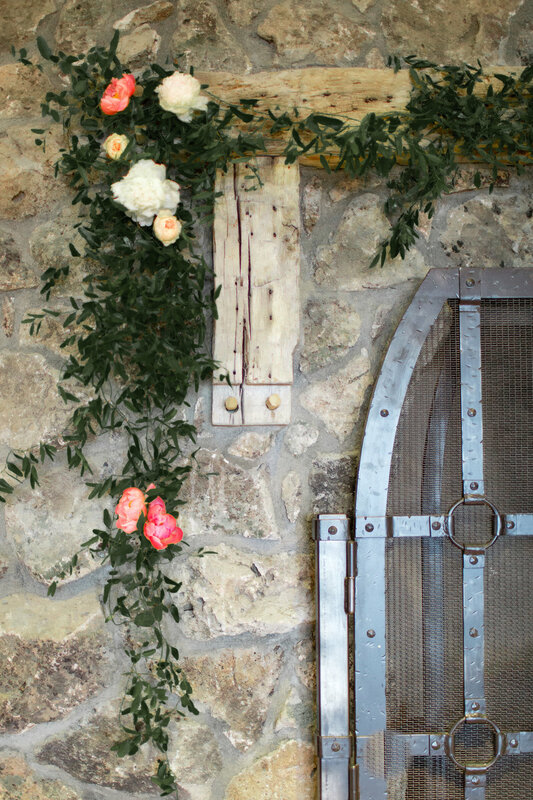 This was a dream project for us to undertake. 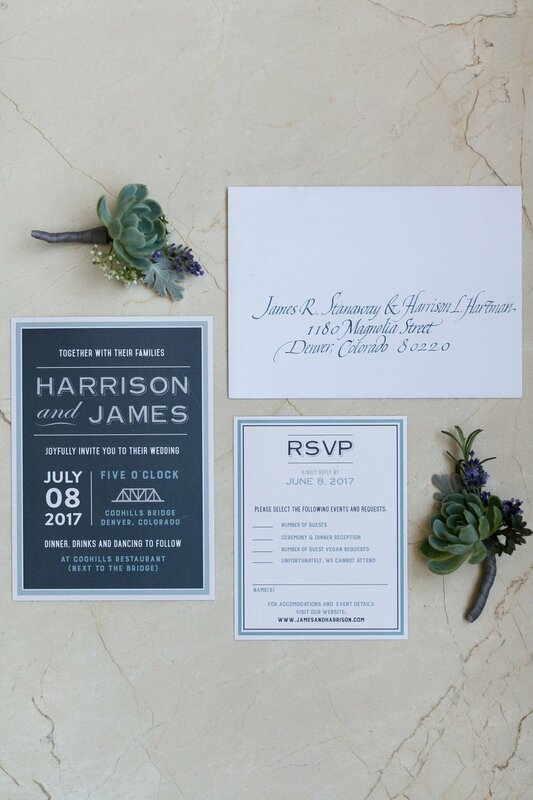 The highlight of this design was lighting. 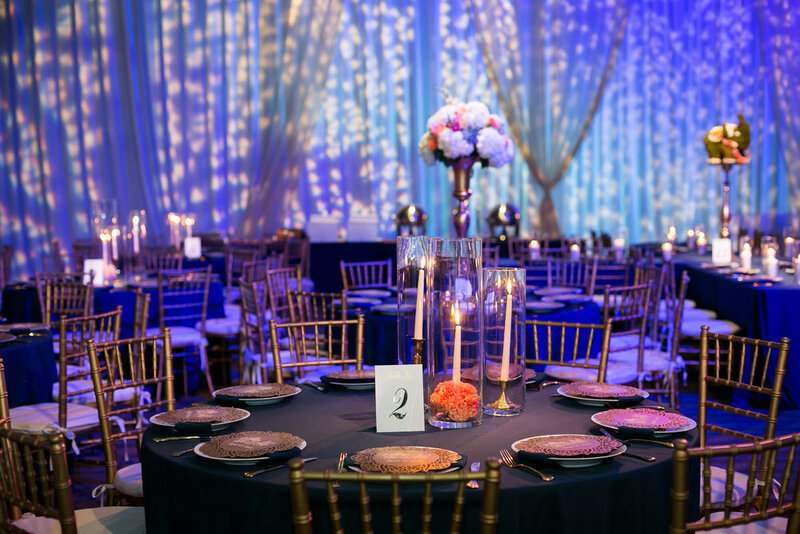 We created custom chandeliers with the help of Elite Entertainment as well as hung hundreds of Edison bulbs from the top of the bridge. 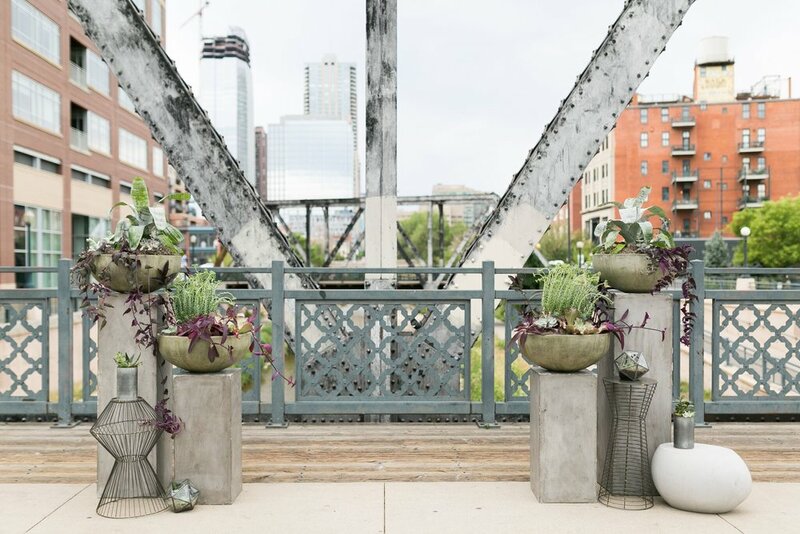 We opted for masculine lounges for seating for the ceremony and complimented the space with concrete planters spilling with greens. 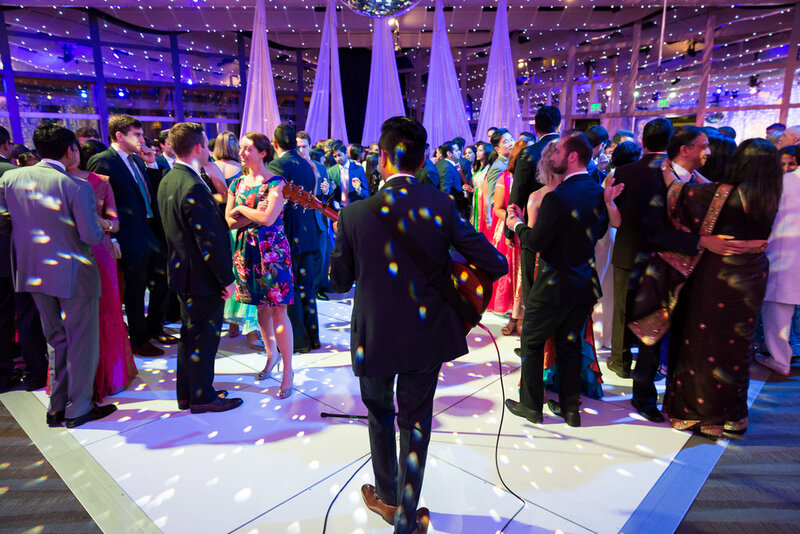 As guests moved inside for an amazing meal by Coohills, we flipped the bridge into a dancefloor and urban lounge. 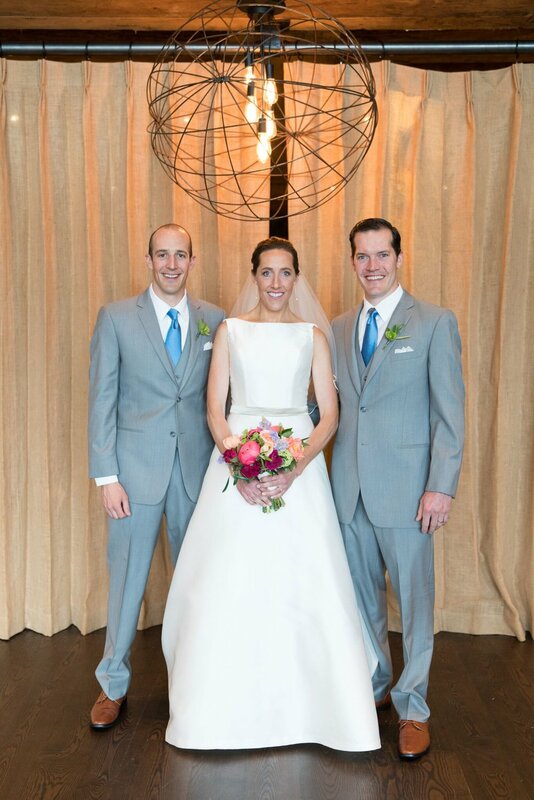 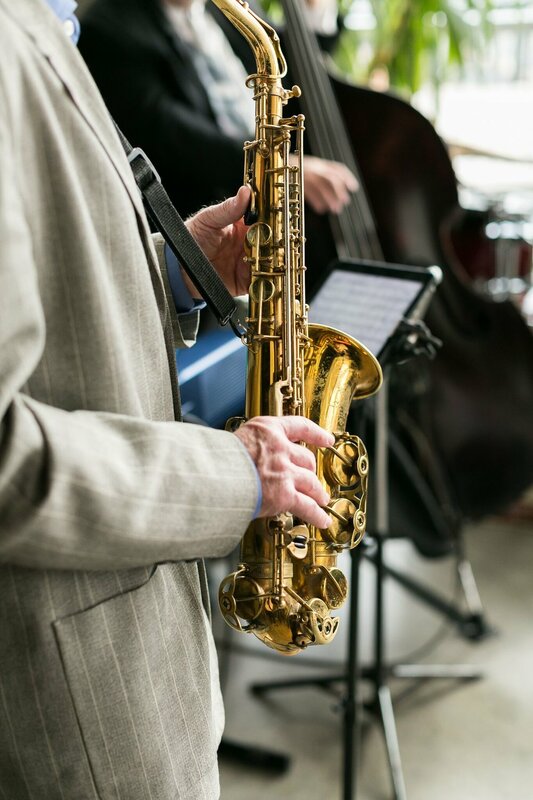 We loved working with these two to create a truly one-of-a-kind experience. 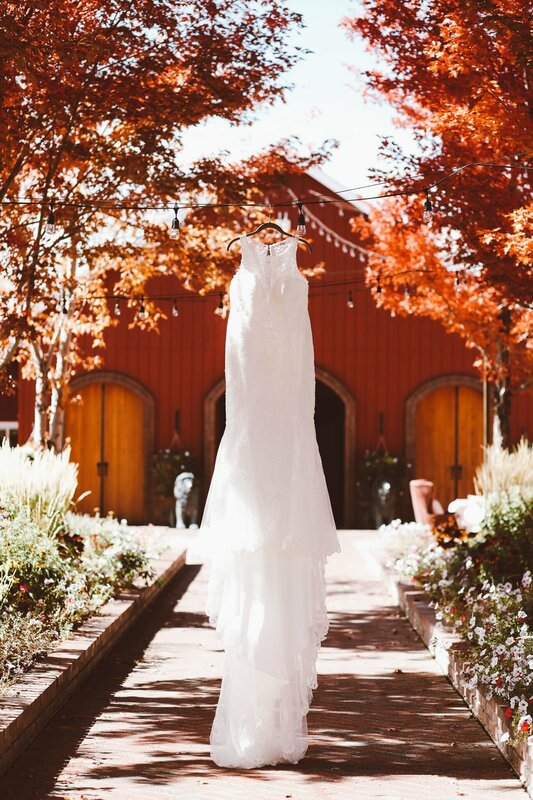 As seen on BRIDES. 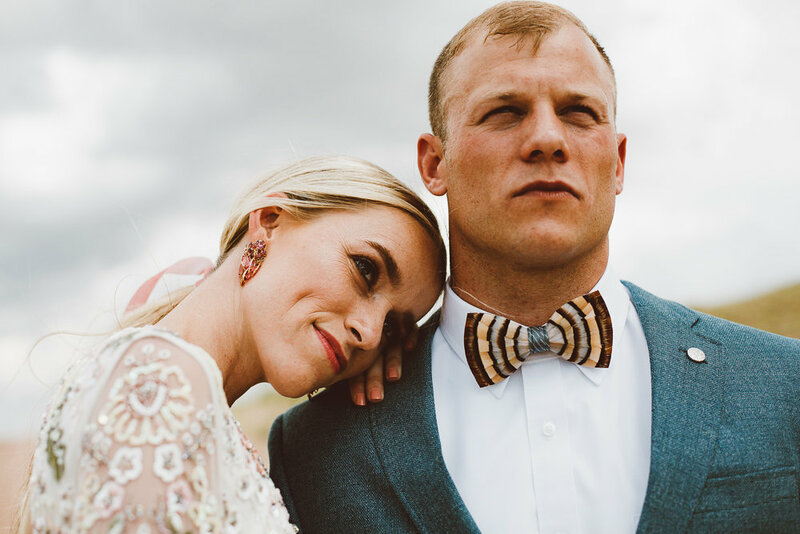 We traveled to Wyoming to the land of gorgeous landscapes, cattle and fabulous country music for Samantha & Jarod's wedding which was held and the groom's parents property. 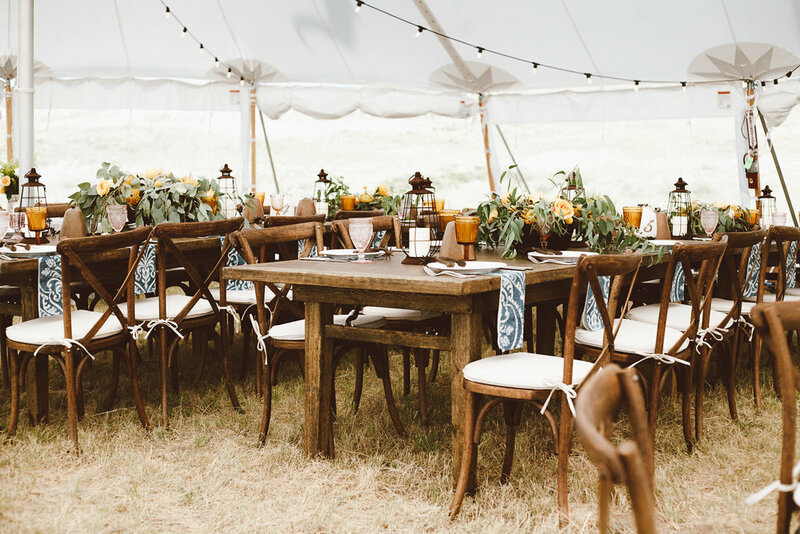 The decor hit the nail on the head when it came to rustic elegance. 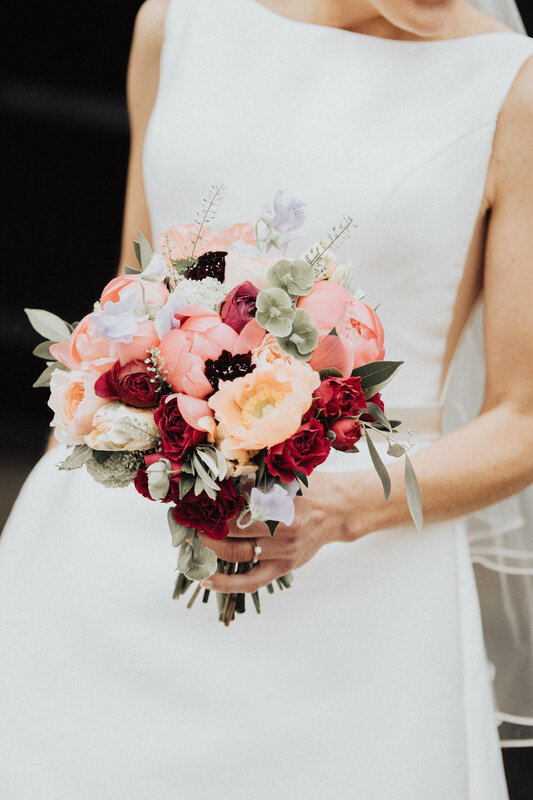 The bride made her own bouquet and table arrangements filling them with yellow, orange and white blooms and tons of greenery to compliment the colors of the surrounding landscape. 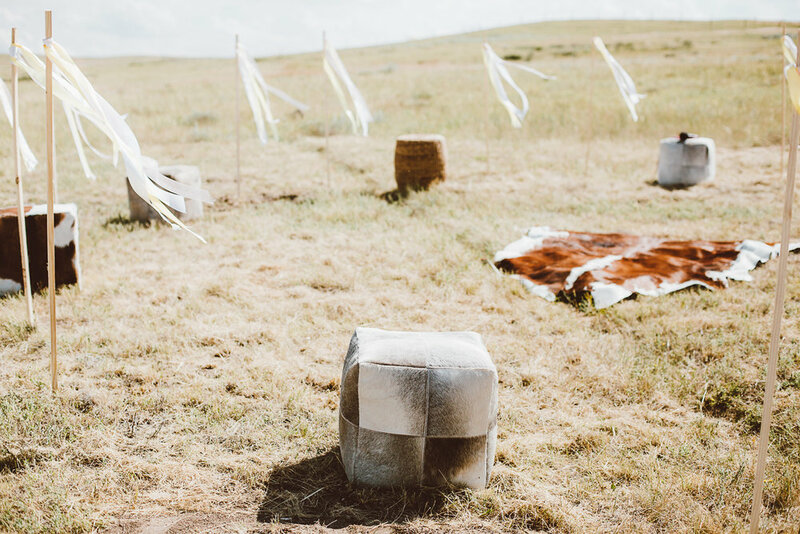 The ceremony and reception being set on a ranch in Wyoming tied in western elements such as with the esport cards which were made with spurs. 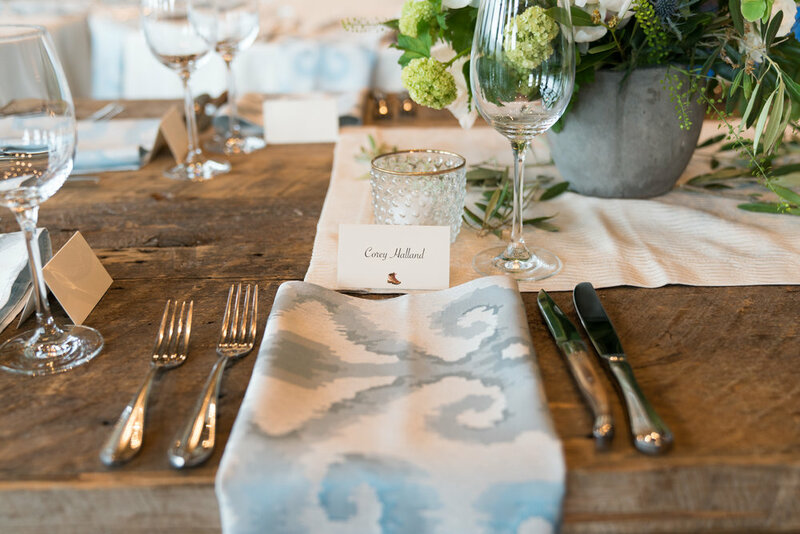 One of our other favorite elements were the blue and white napkins that tied in the beautiful Wyoming blue sky. 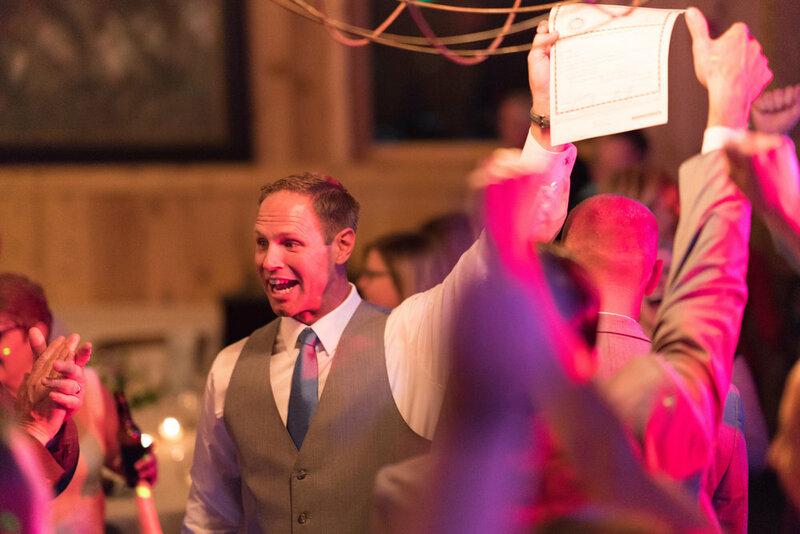 Guests enjoyed an evening of great food, tears and laughter, and fantastic country music! 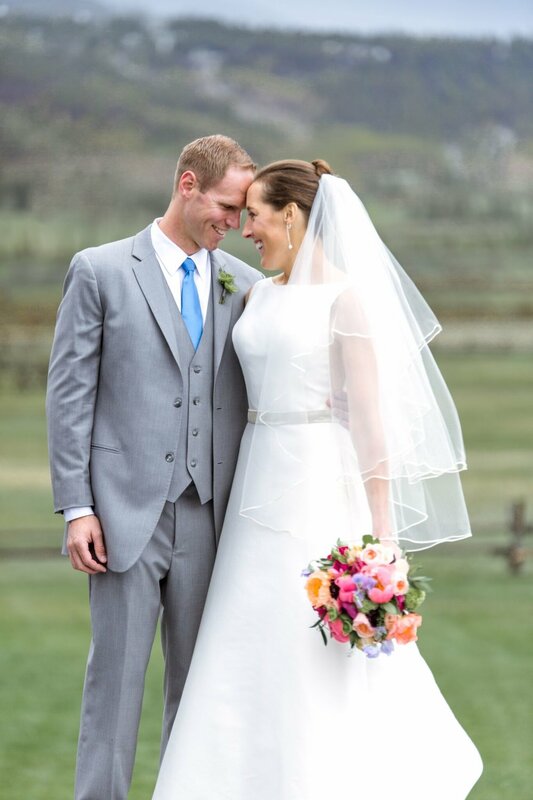 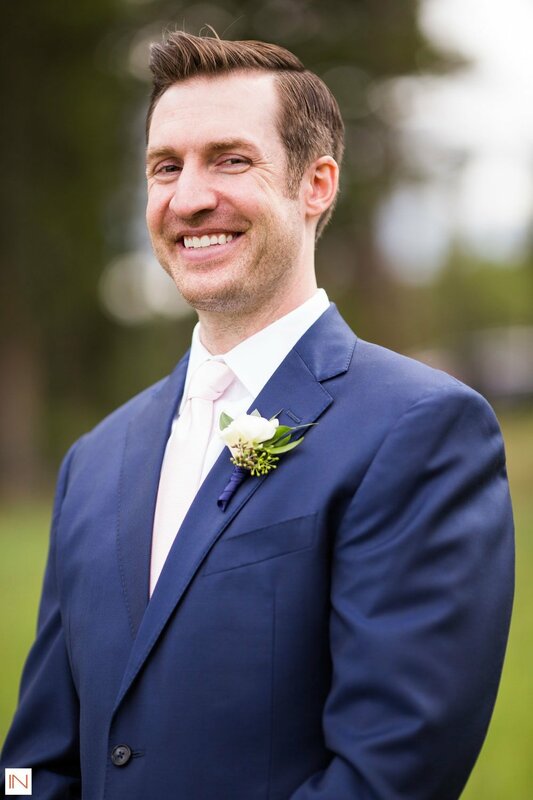 We just can't get over the way that Jarod looked at his bride, it melted our hearts! 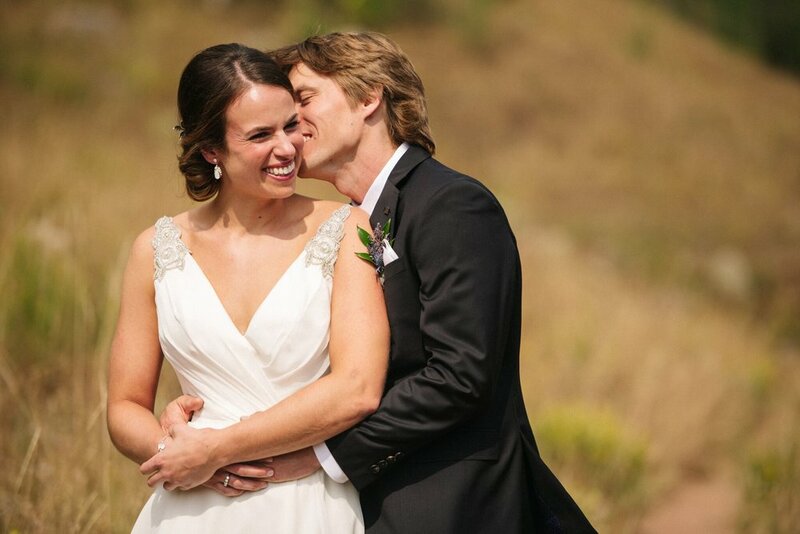 There are some couples that just make our hearts sing and reignite our passion for what we do. 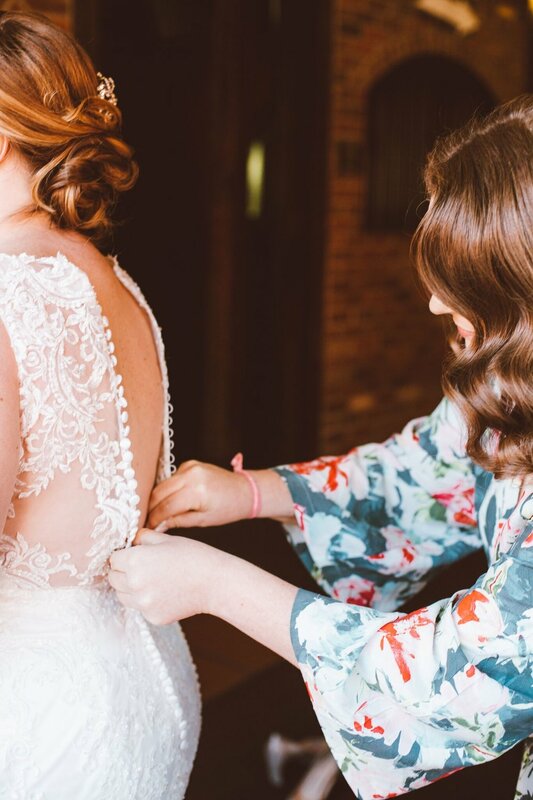 Ally and Aimee had this amazing way about them that wrapped every vendor they came across in pure love. 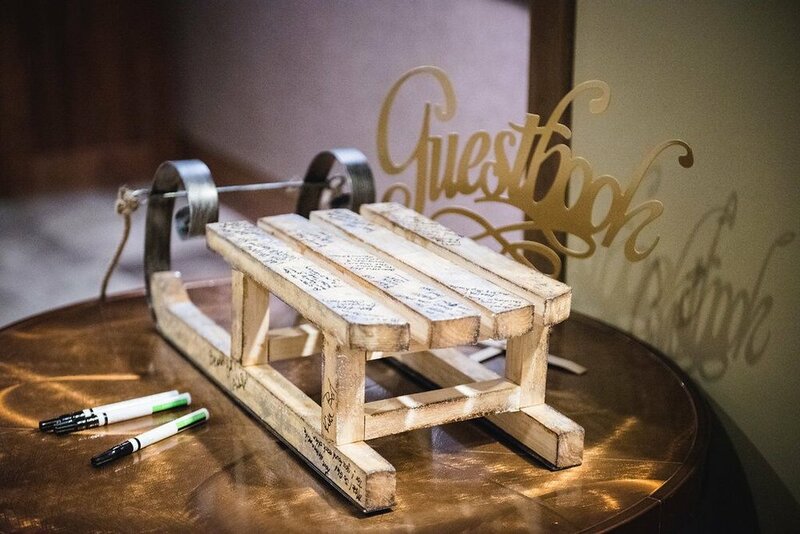 They allowed me to run with unique design ideas including a meandering table, personalized thank you notes for every guest, branded cheeseboards and two days of celebrating! 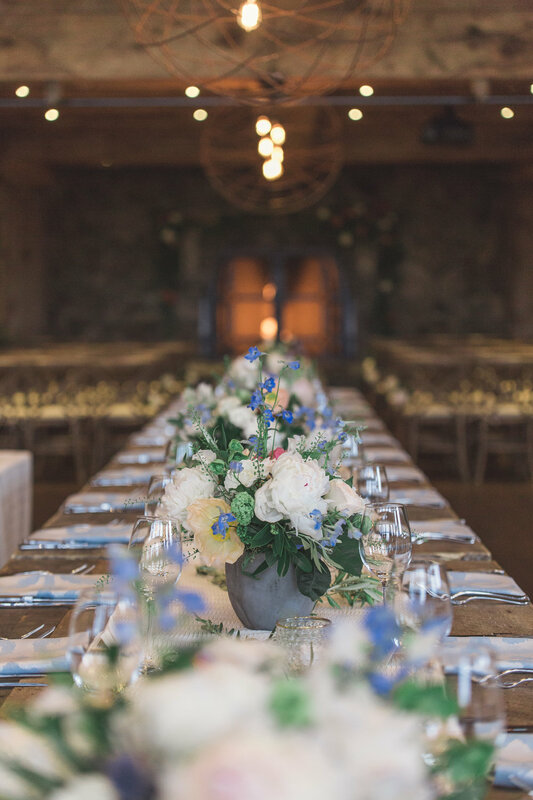 Luscious floral arrangements with soft toned flowers and greenery filled the long table, perfectly complimenting the stunning food by Blackbelly Catering. 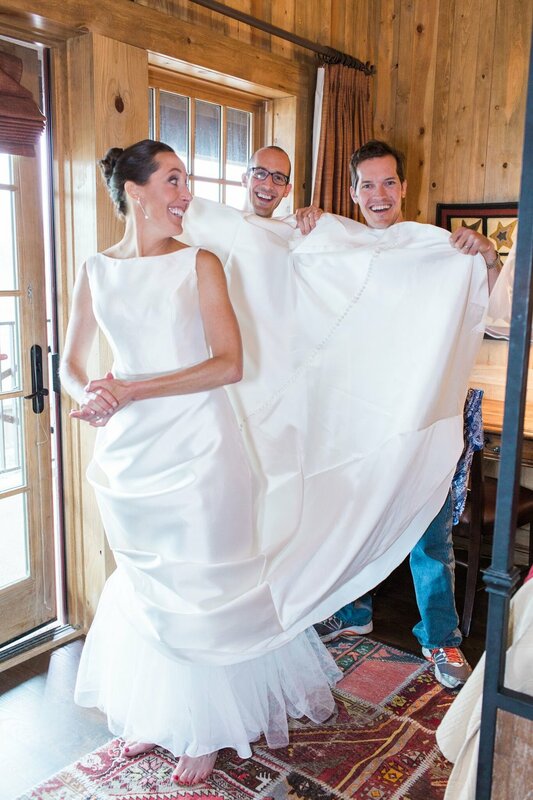 It is amazing what happens when a couple really trusts their wedding planning team to come up with greatness. 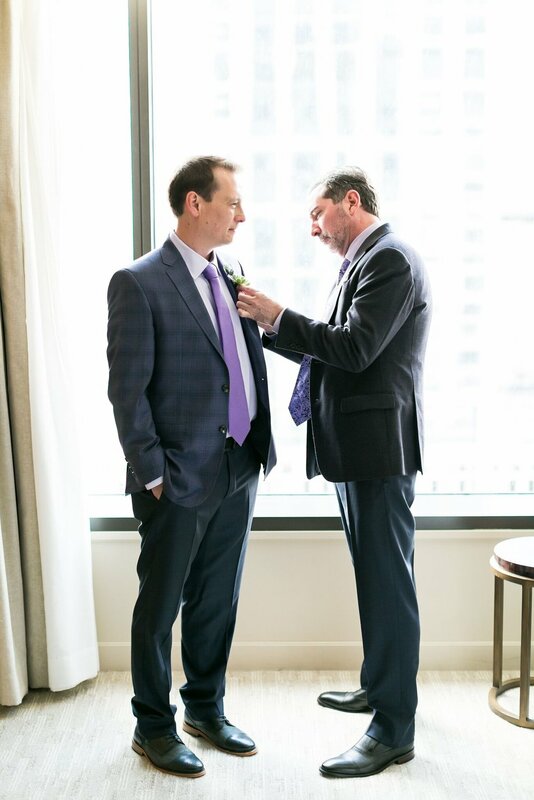 The images below speak for themselves. 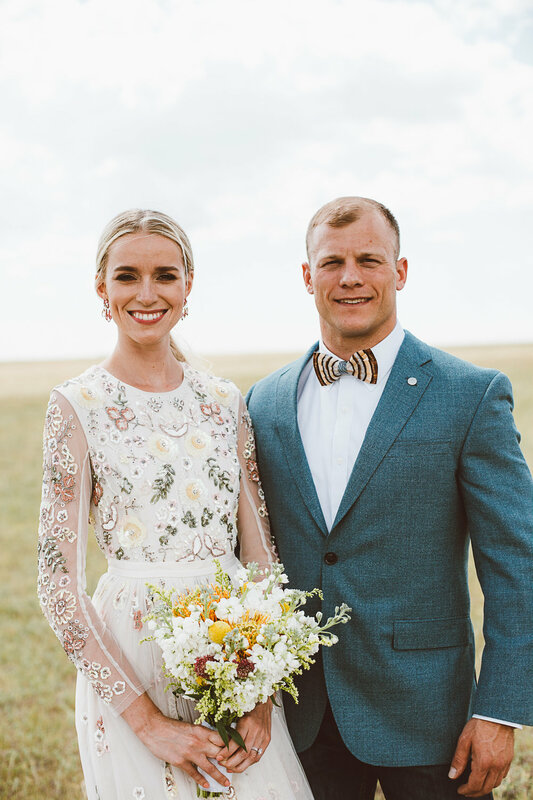 We love seeing this mountain wedding grace the pages of Artfully Wed!! 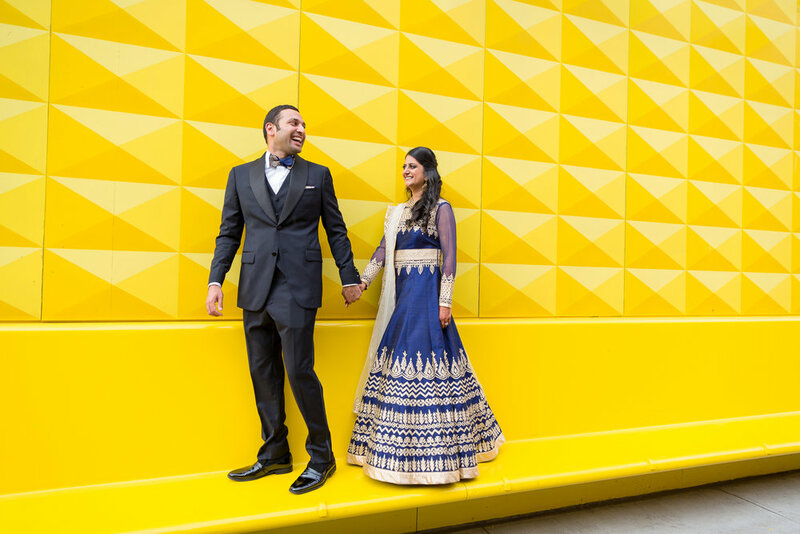 We wanted the ceremony to feel like a sunrise and implemented a beautiful ombre color scheme for the Mandaap. 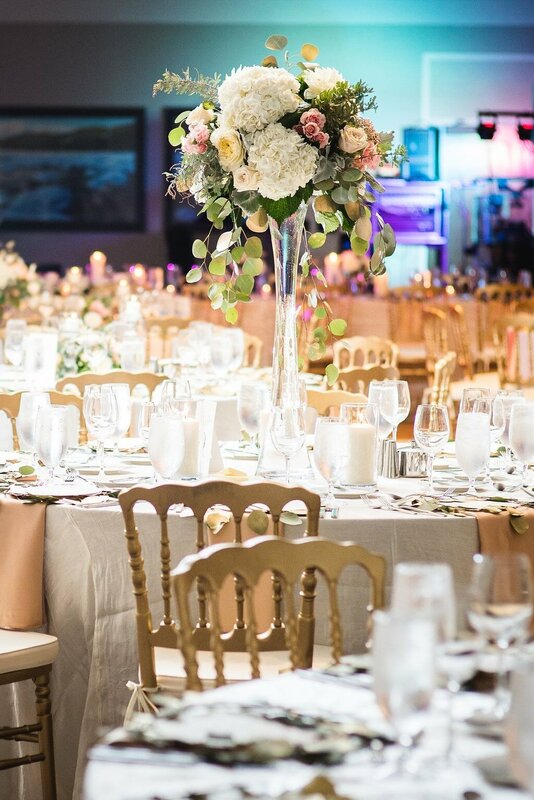 The reception chairs well elegantly displayed in royal gold. 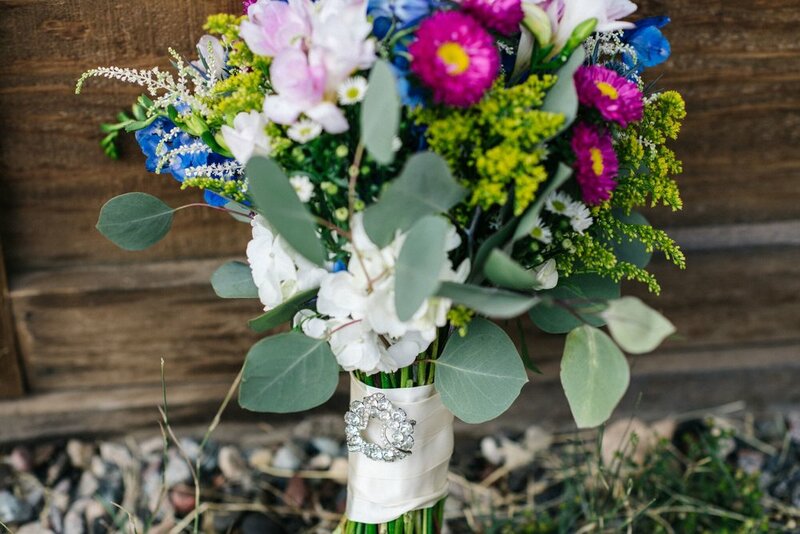 The florals were our favorite touch. 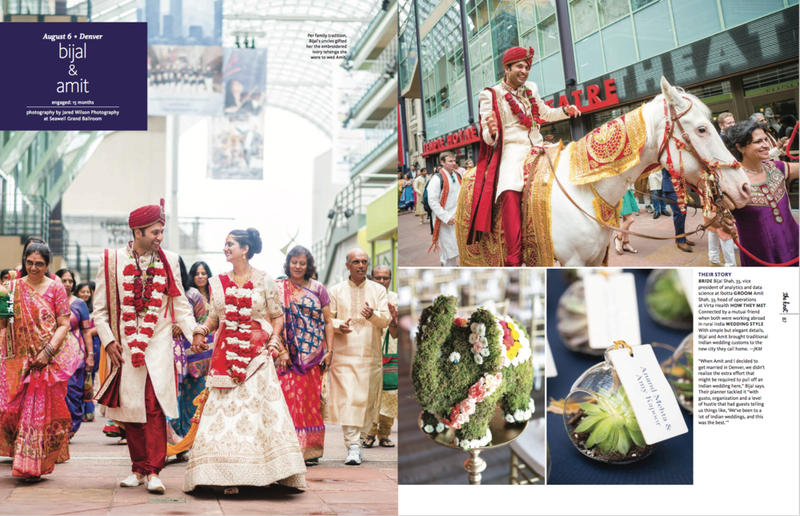 It is traditional for a groom to arrive via elephant in Indian wedding, We didn't have one elephant, we had six! 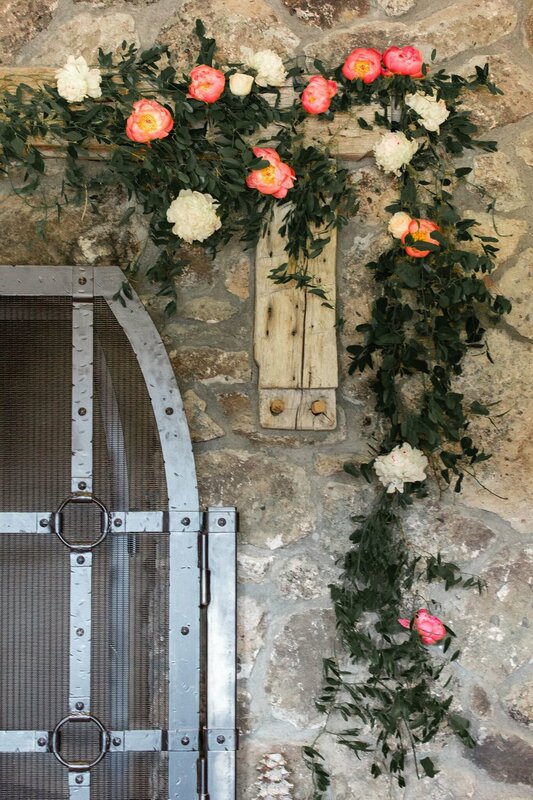 Made out of flowers that is! 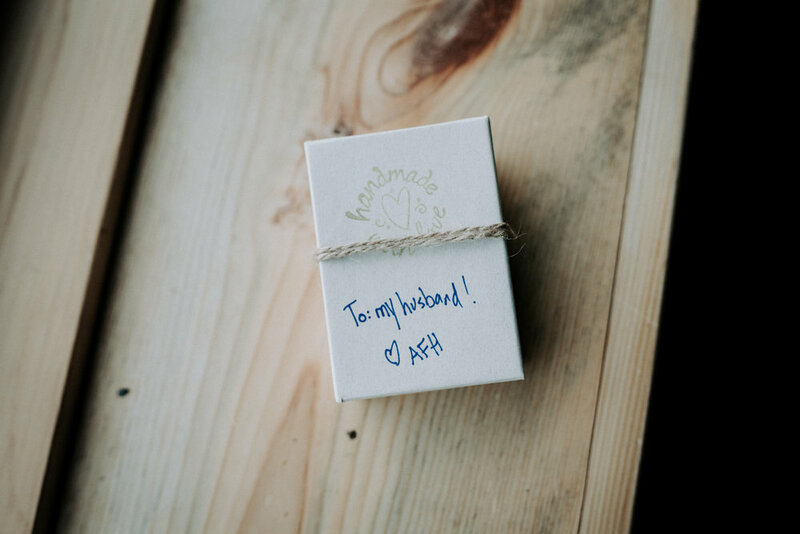 We loved this sweet and unique personal touch. 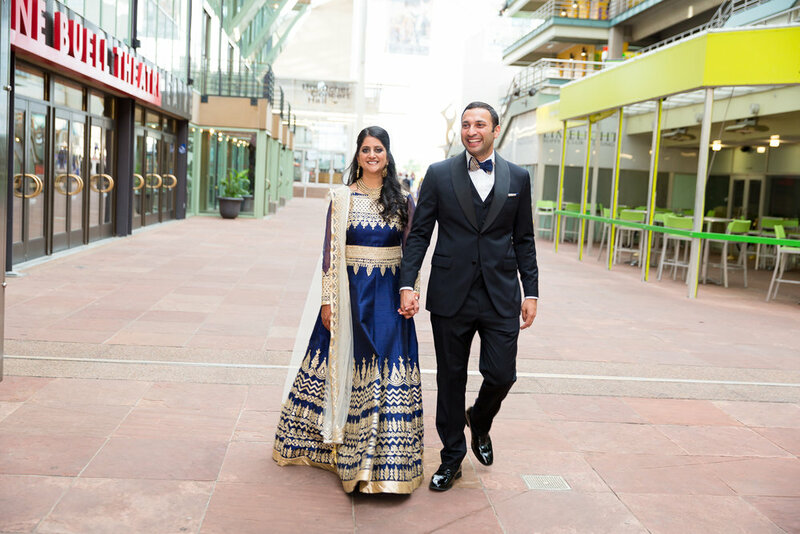 After the ceremony guests enjoyed lunch from an array of food trucks in the outside pavilion and then returned to their hotel to change for the reception that evening. 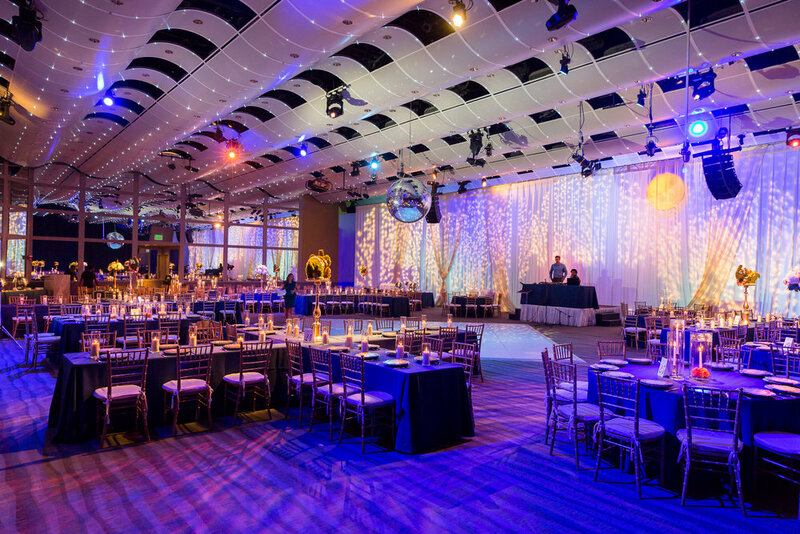 While guests were freshening up, we set to work transforming the ballroom into a midnight ball. 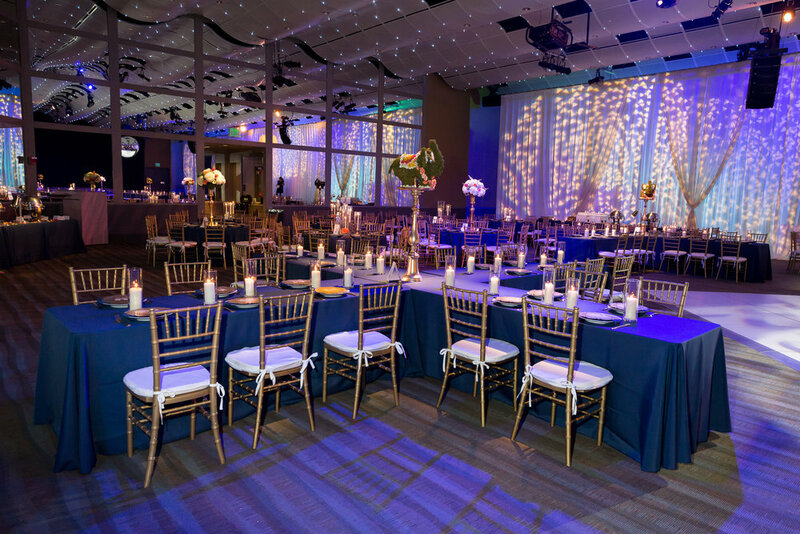 Deep blues find the space as we projected an amazing gobo on soft drape, complete with a moon. 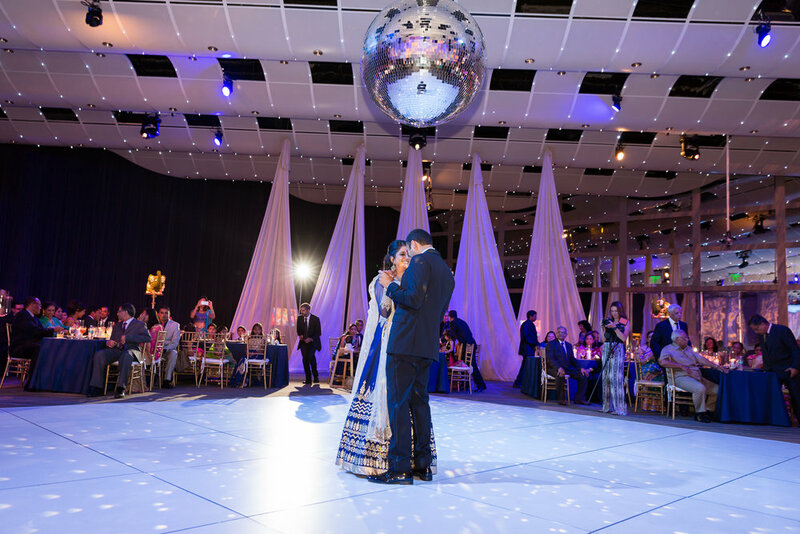 Guests danced the night away and the grand finale was 20 pounds of confetti pouring form the ceiling. 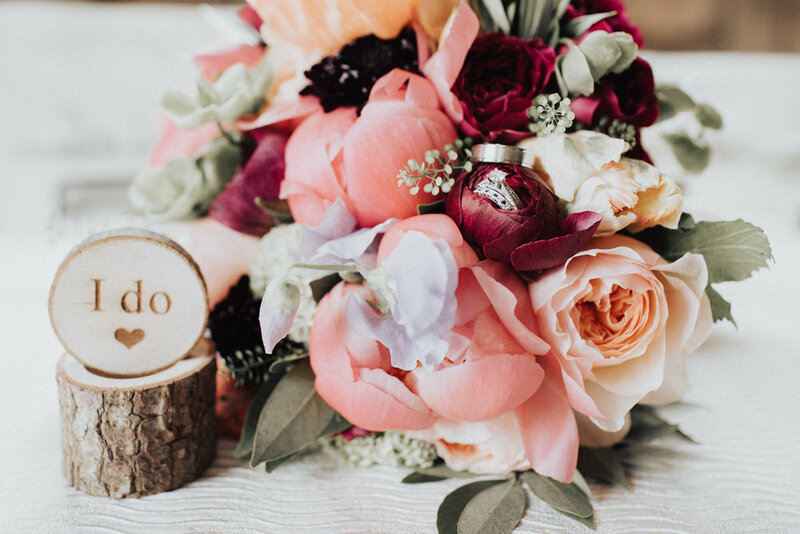 This wedding was definitely one for the books! 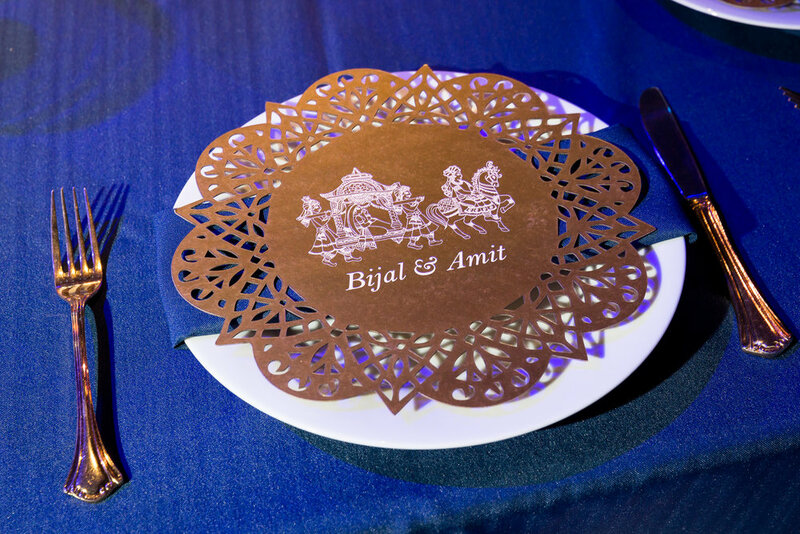 We put our heart and soul into making Bijal and Amit's wedding perfect! 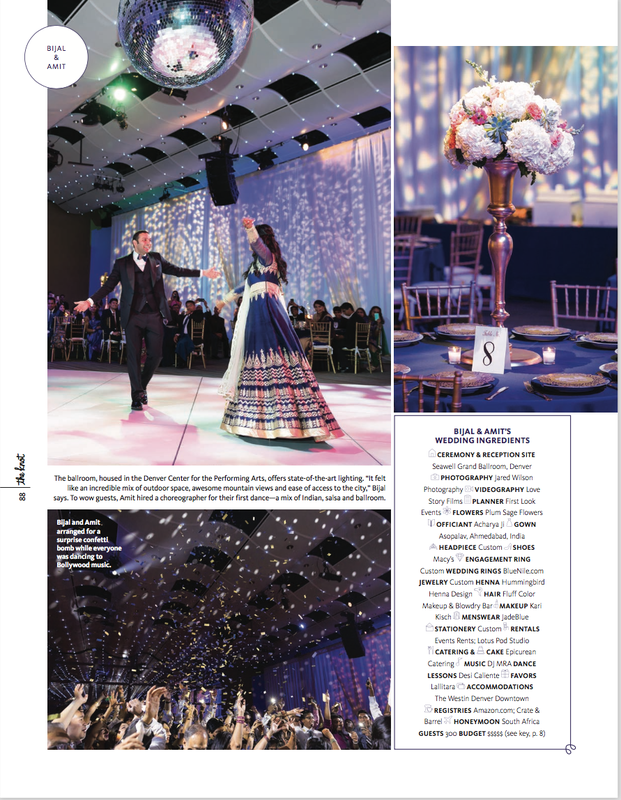 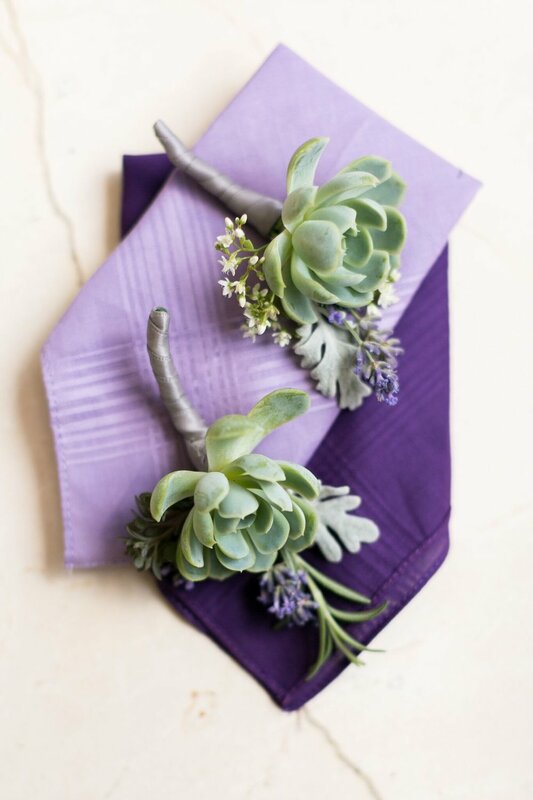 We are thrilled to see it gracing the pages of the The Knot! 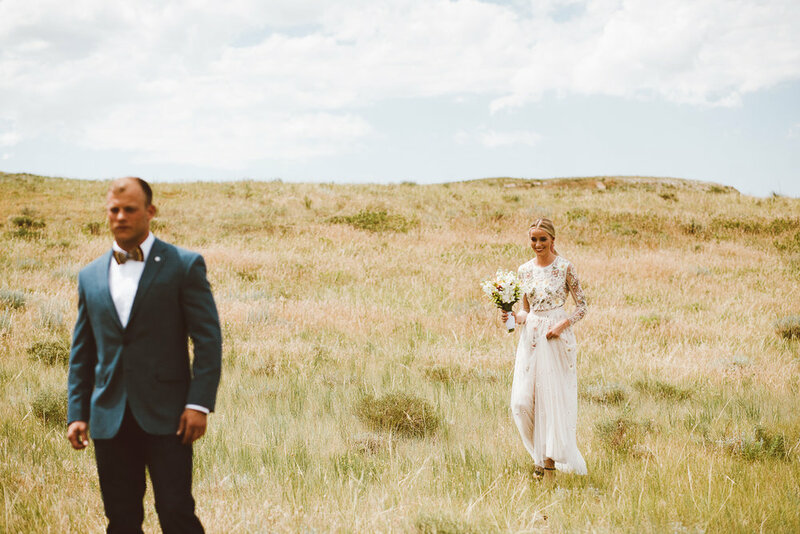 Wyoming Wedding Published on BRIDES!! 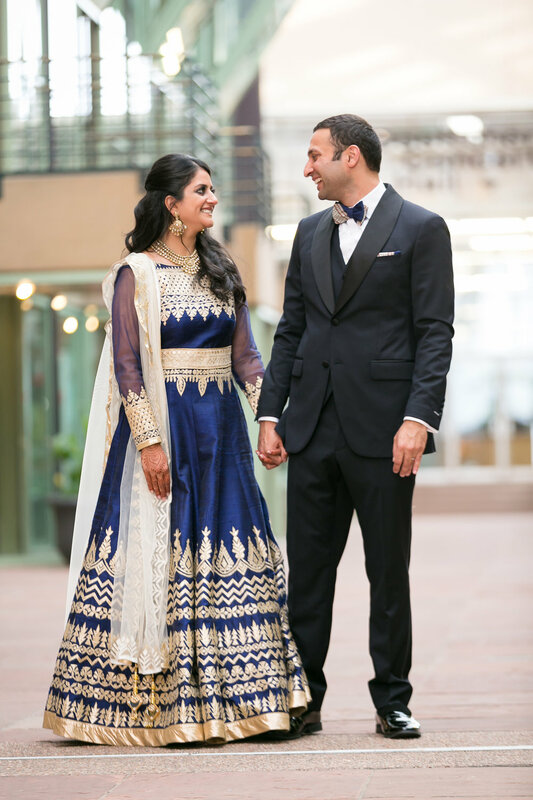 We are over the moon to have this amazing wedding featured on BRIDES . 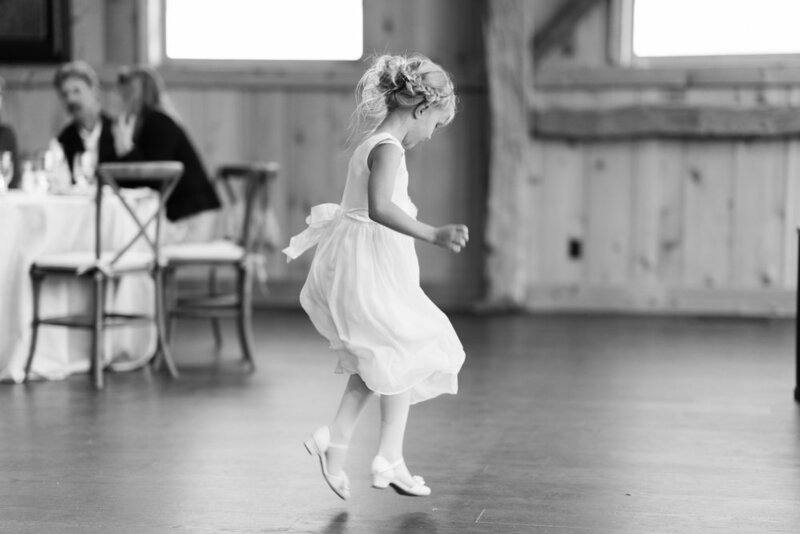 We will have our own blog up soon but for now jump on over to BRIDES to see some amazing images of the day. 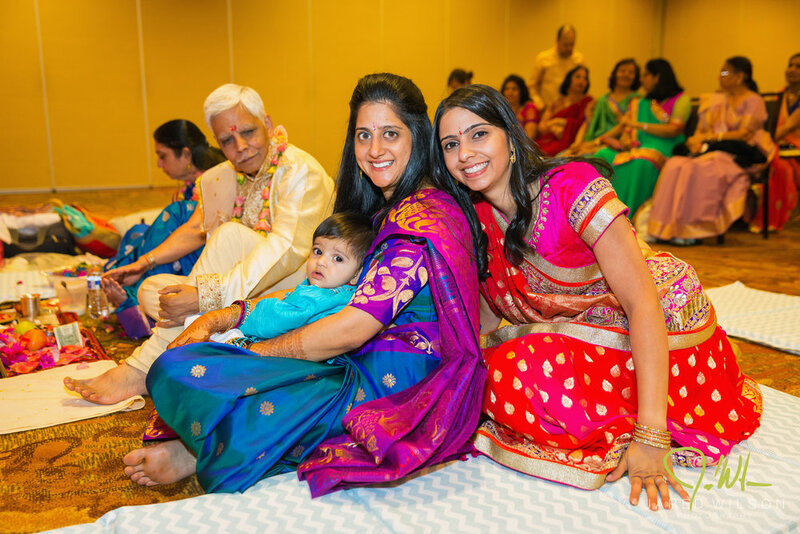 We had the absolute honor of spending three days with Bijal, Amit and their families. 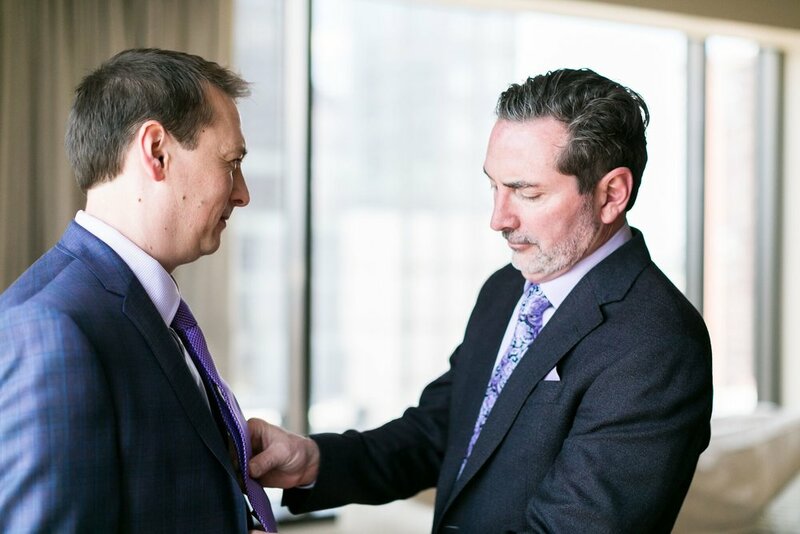 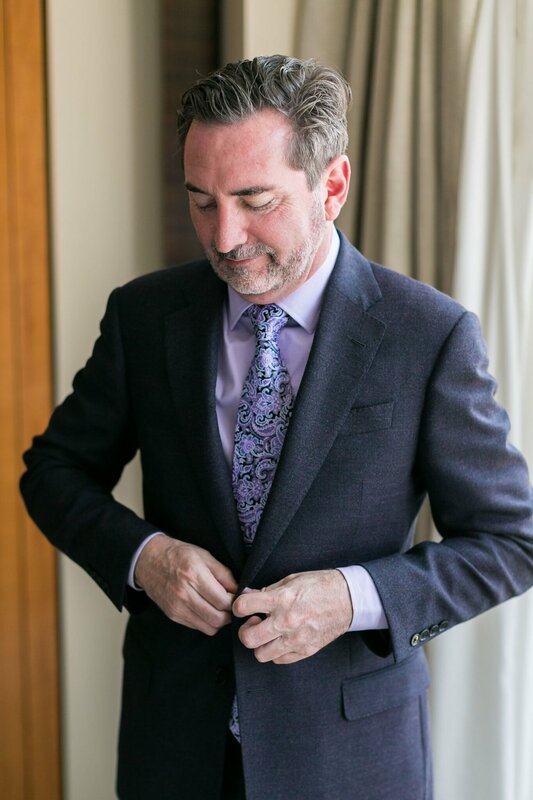 The ceremonies that we had the pleasure of witnessing are steeped in tradition. 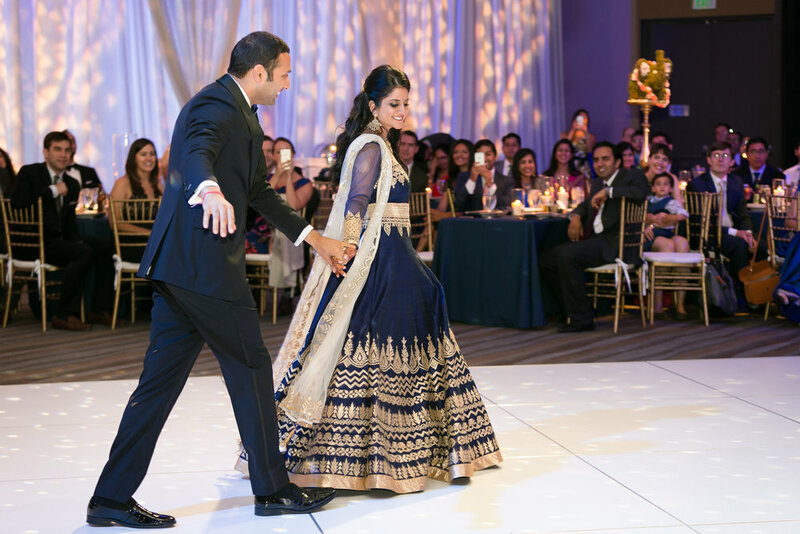 The colors, music, dance and joy spilled through every aspect of their wedding weekend. 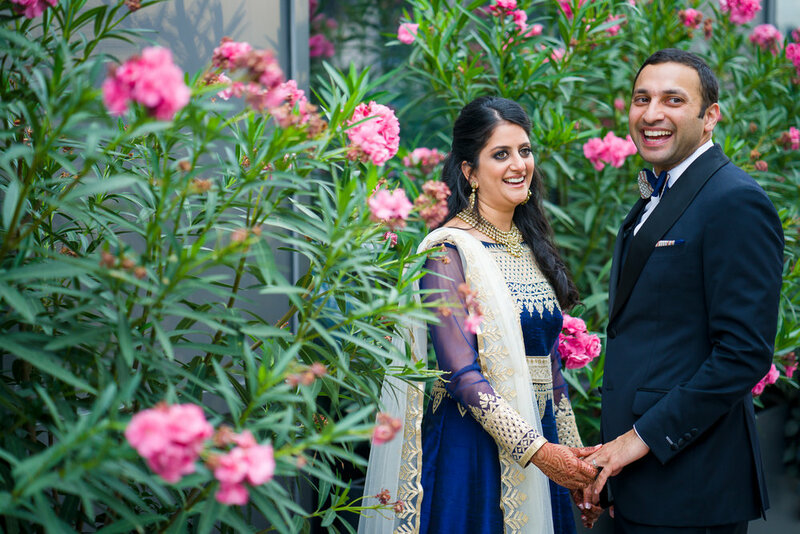 One of the most important pre-wedding ceremonies in Indian marriages is the mehendi ki raat. 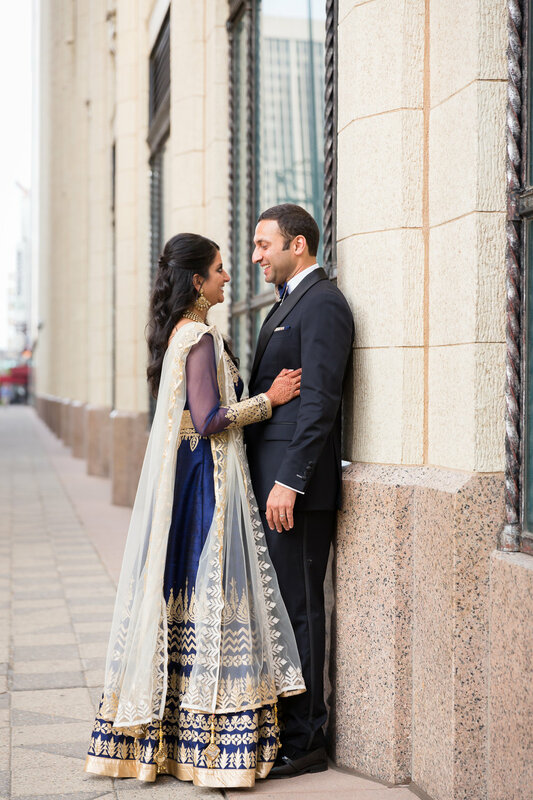 The beautiful bride-to-be adorns her hands and feet with striking designs made out of henna. 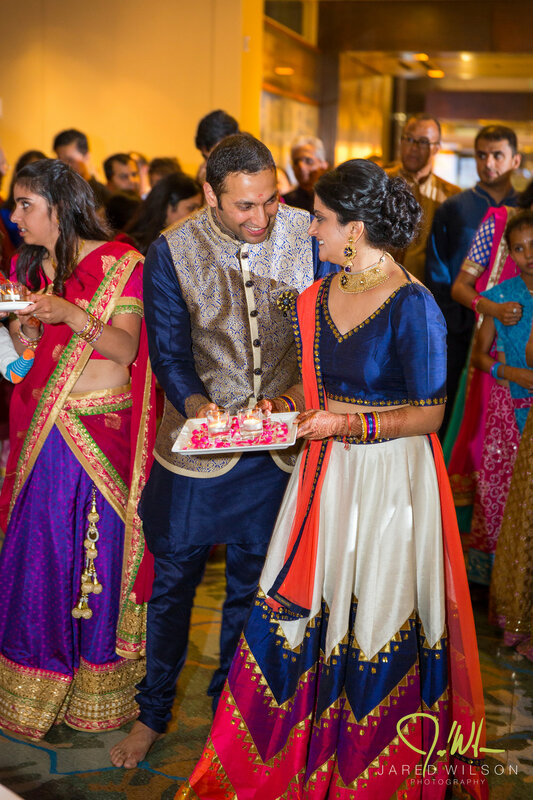 As per the traditions, even the groom applies a bit of mehendi on his hands as well as feet. 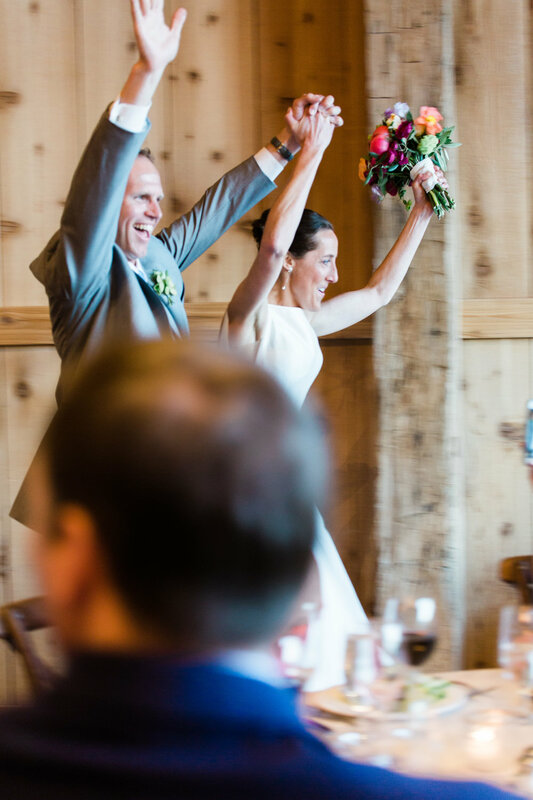 The entire ceremony is a fun-filled event with every family member and close friends of the bride and the groom being a part of it. 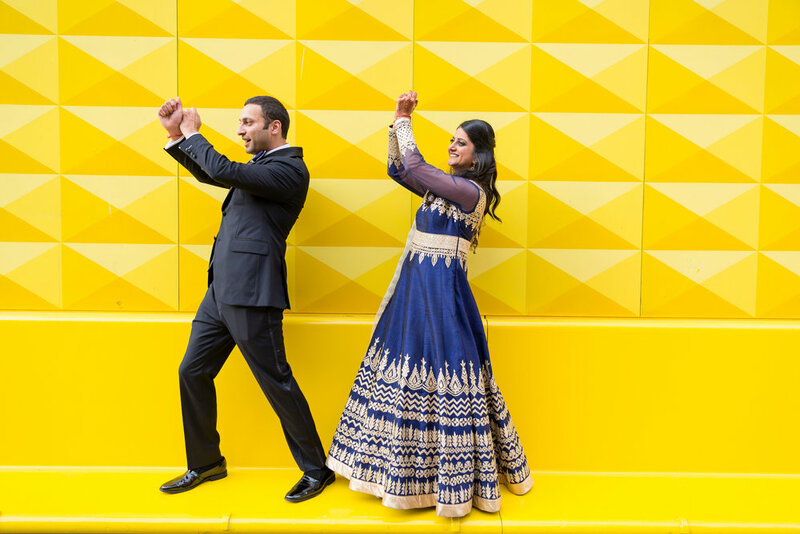 But, apart from being a fun pre-wedding ritual, the mehendi ceremony also has a deep-rooted cultural significance to it. 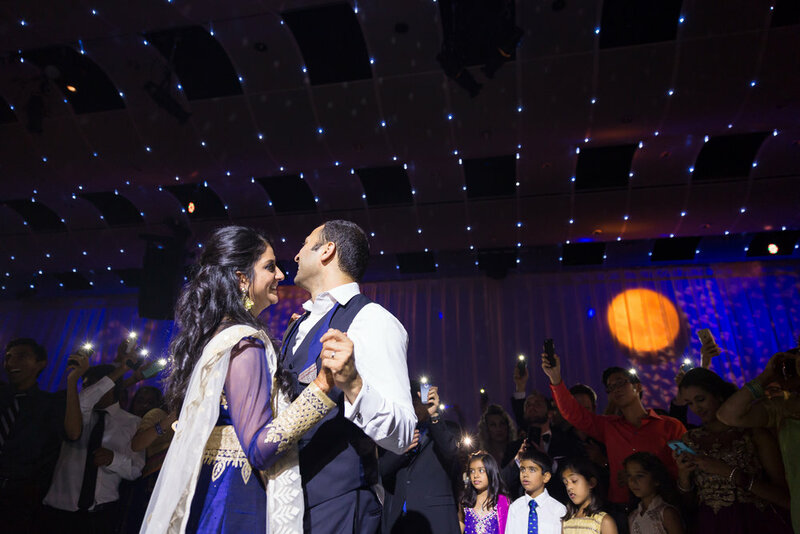 · The darkness of the mehendi colour on a bride’s hand represents the deep love between the would-be-couple. 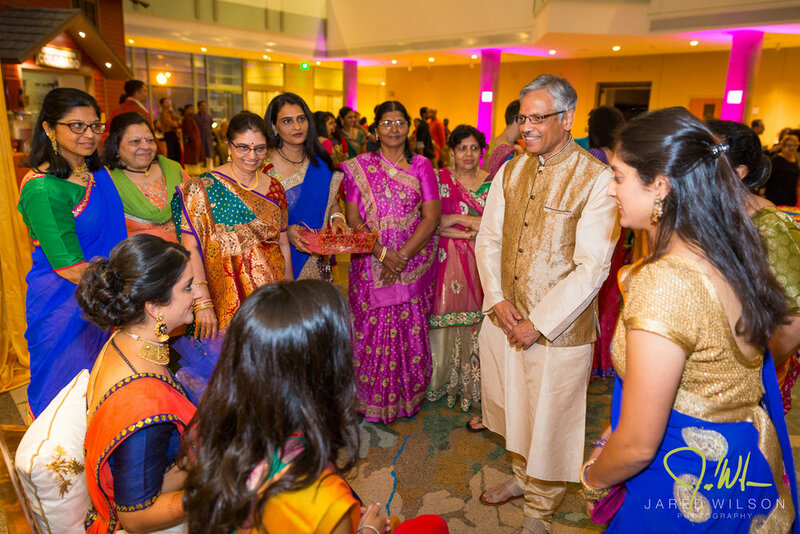 · The mehendi's colour also shows the love and understanding between the bride and her mother-in-law. 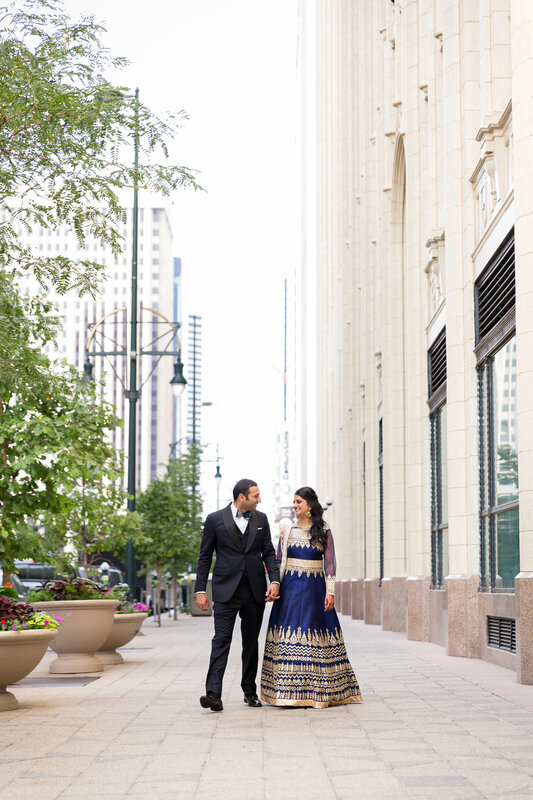 · The longer the mehendi retains its colour, the more auspicious it is for the newlyweds. 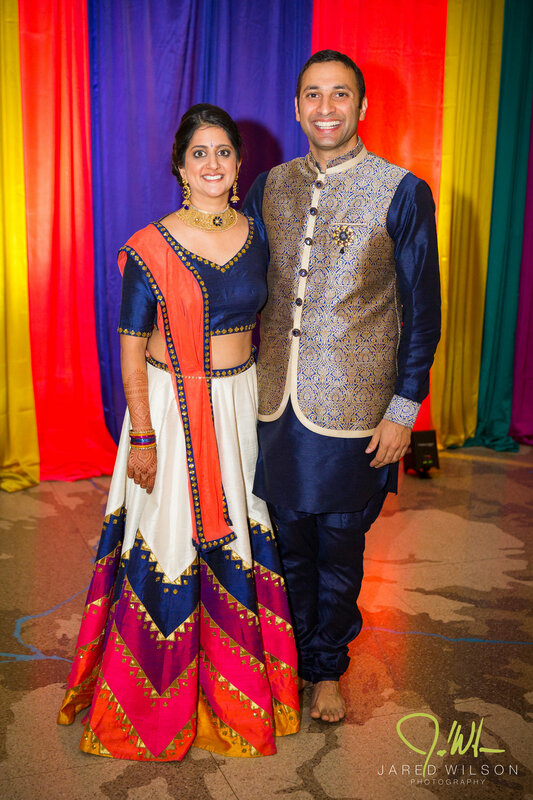 · Mehendi is also deemed to be a symbolic representation of fertility. 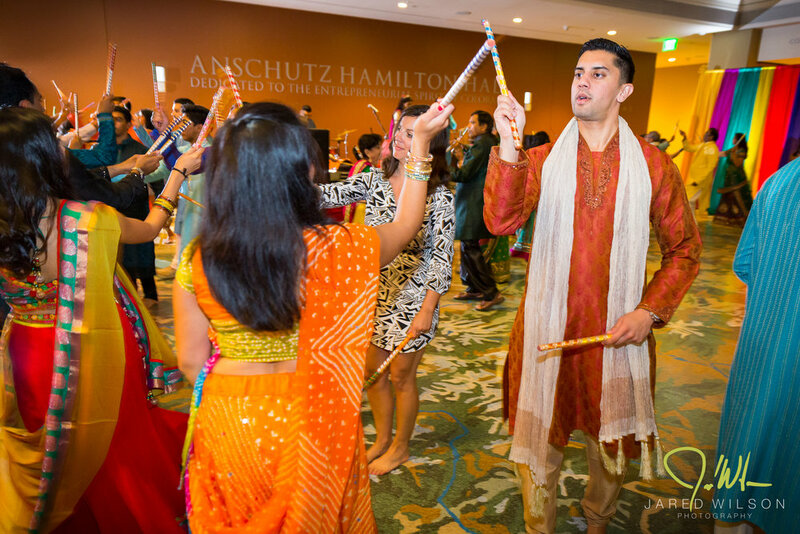 A Garba is typically held a day or two before the wedding. 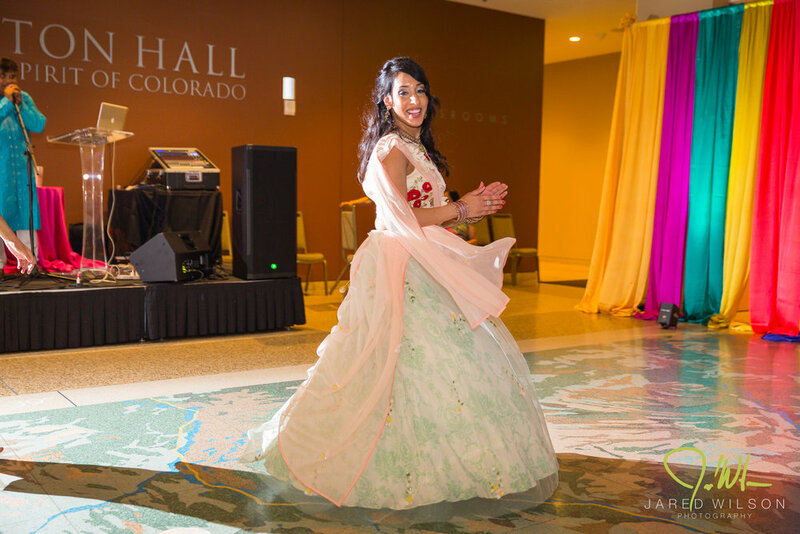 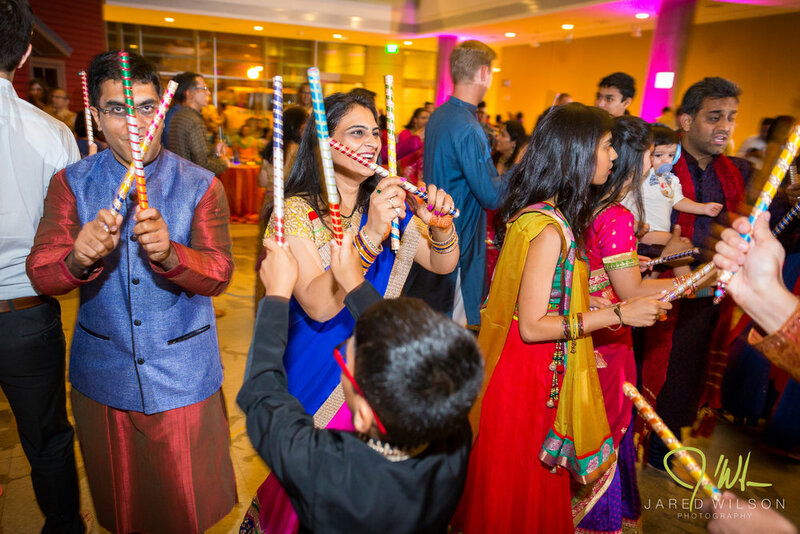 This event is a colorful and fun-filled party, usually involving dancing "Garba", a traditional dance of Gujarat, India. 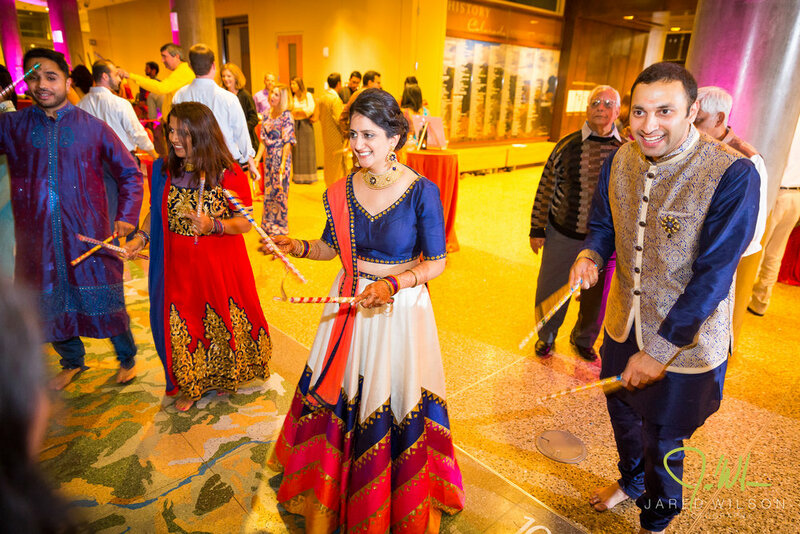 Garba is performed in a circle and the steps are often complicated. 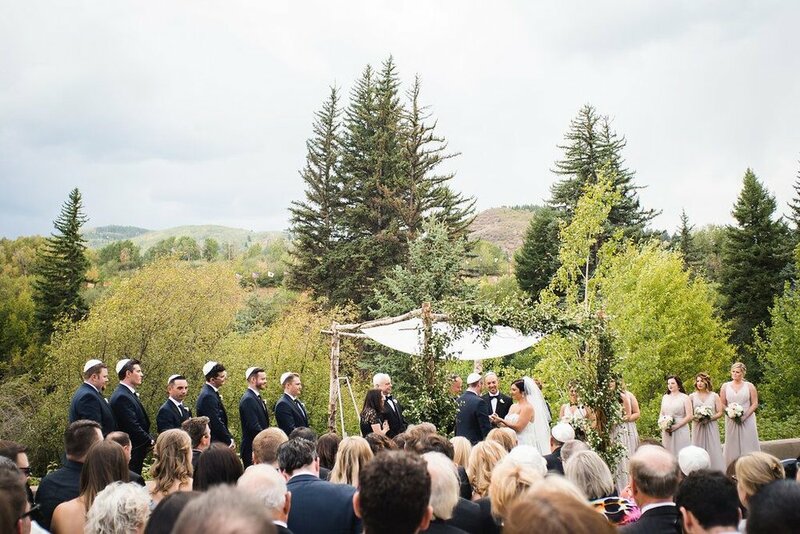 Ali & Tony love spending time outdoors, so naturally they wanted to say their vows in a beautiful setting tucked away in the mountains. 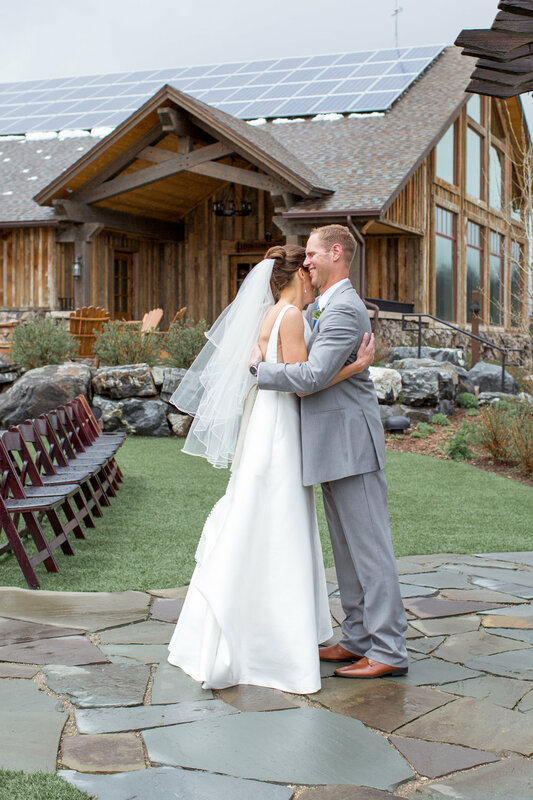 Devil's Thumb Ranch was the perfect venue for these two! 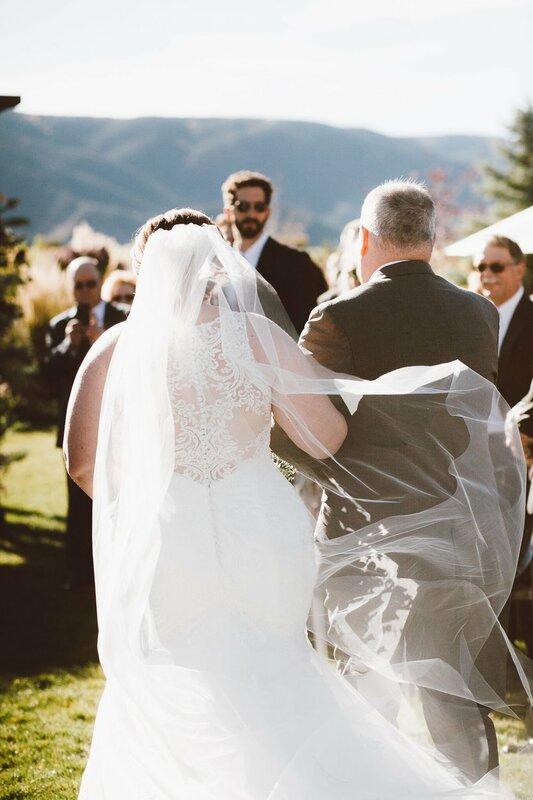 When the wedding day arrived ( the last week in May) the weather was gorgeous at the rehearsal and everyone was excited for the next day. 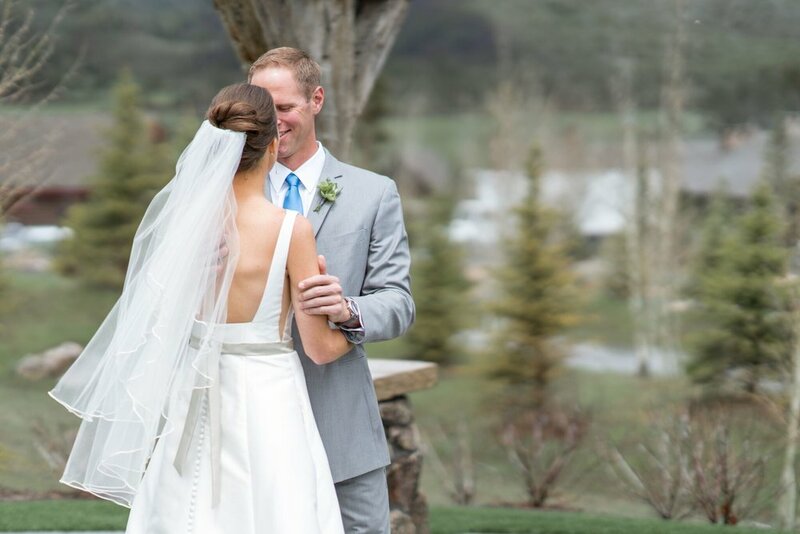 Then as only Colorado can do, the weather changed drastically. 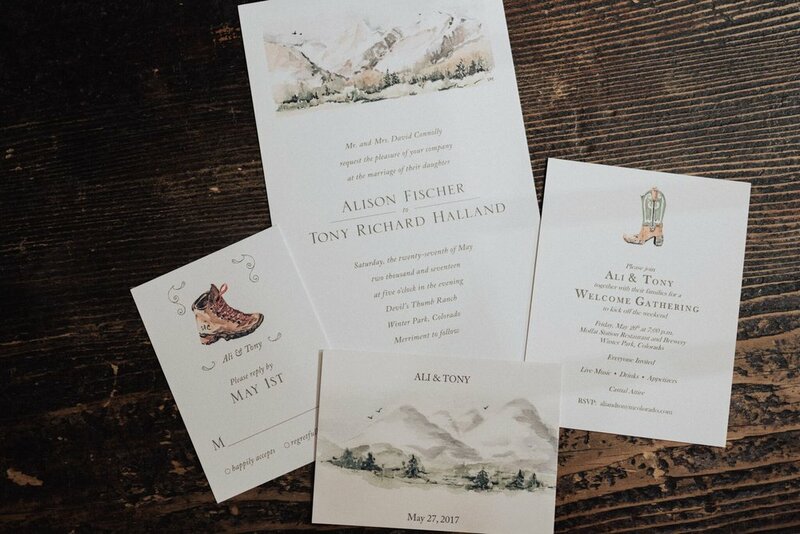 By the time Ali & Tony were set to say their I Do's there was a full on blizzard happening at their ceremony site. 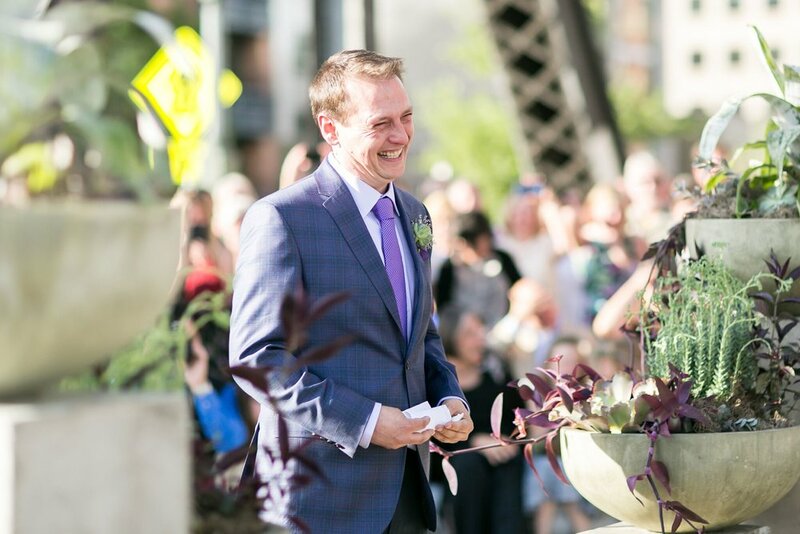 We kicked it into high gear and turned our reception site into the ceremony site. 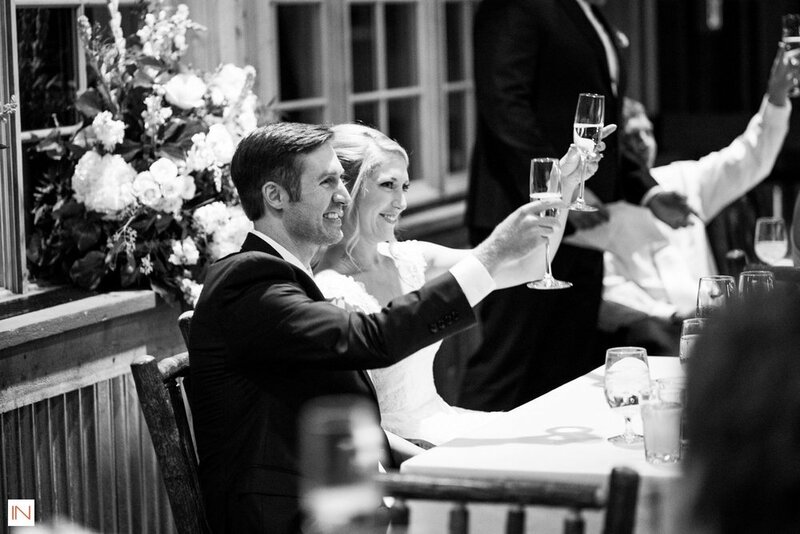 They bride said it best "Plan B turned out to be way better than Plan A." 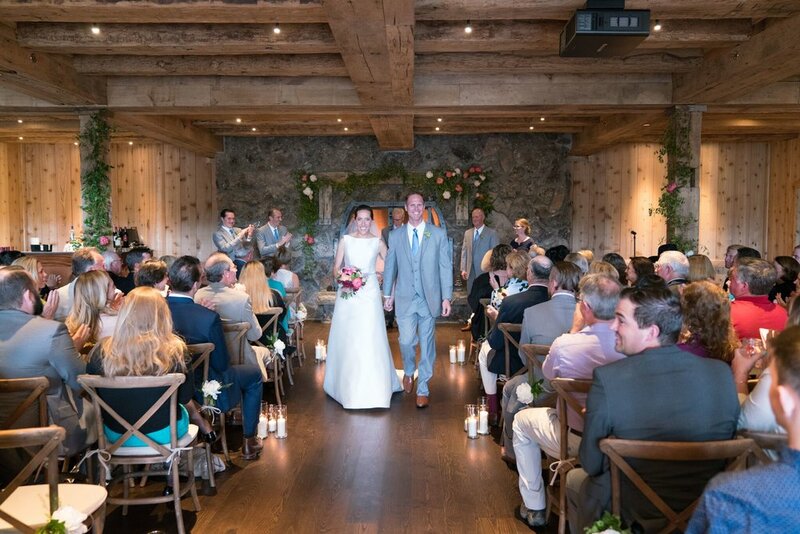 They got married in front a gorgeous stone fireplace and enjoyed cocktails in a cozy loft while the room was flipped. 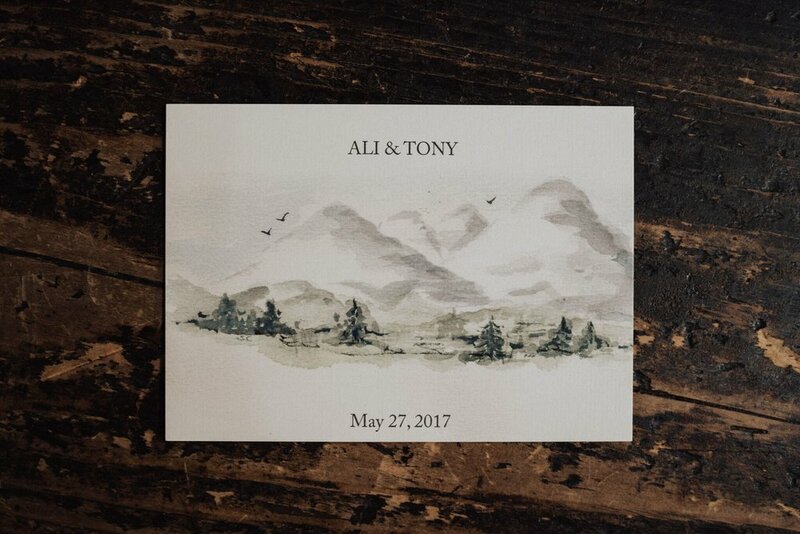 Throughout the whole process Ali & Tony were a dream to work with, they have such an amazing sense of humor and love for each other. 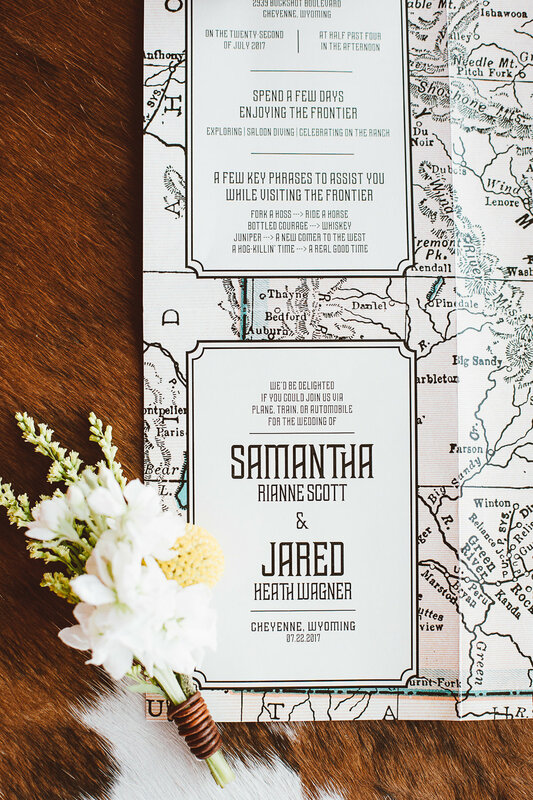 We wish them a life time of adventure! 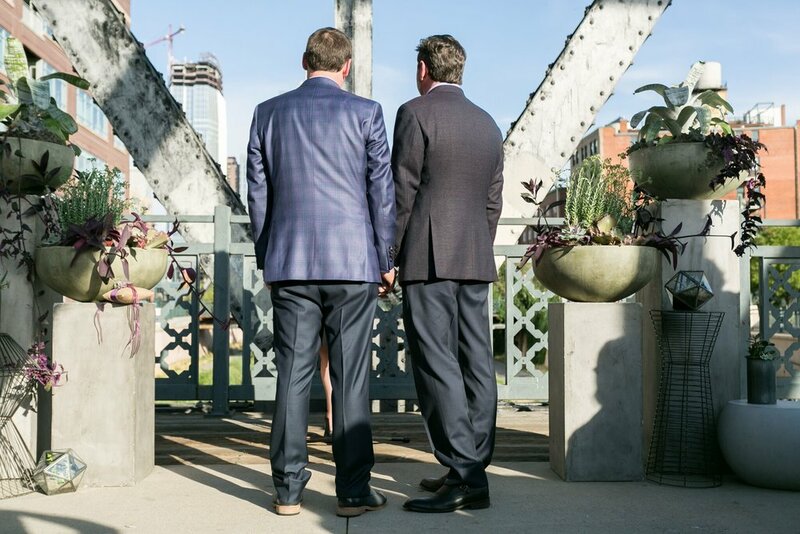 When we first met with Ken and Dave they had a clear vision of the era they wanted to channel for their wedding day. 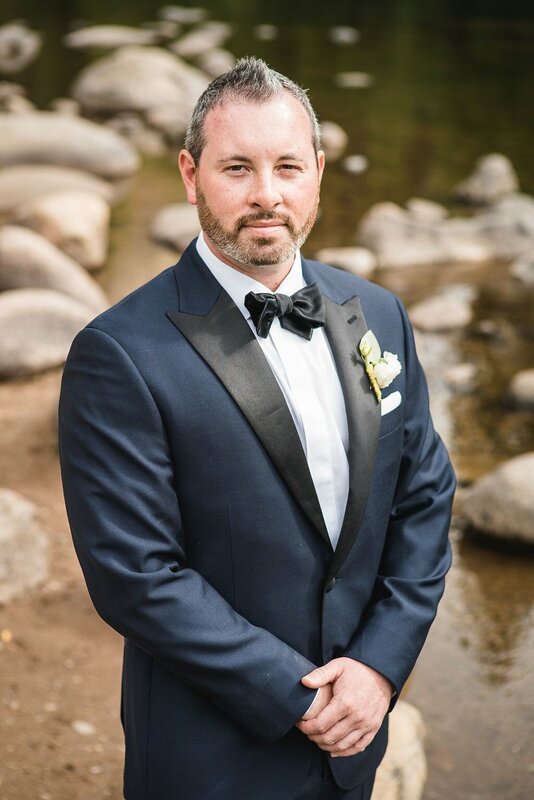 We highlighted the best of 1950's mid-mid style for their wedding reception at Michael Warren Contempory Gallery in the heart of the Santa Fe Arts district. 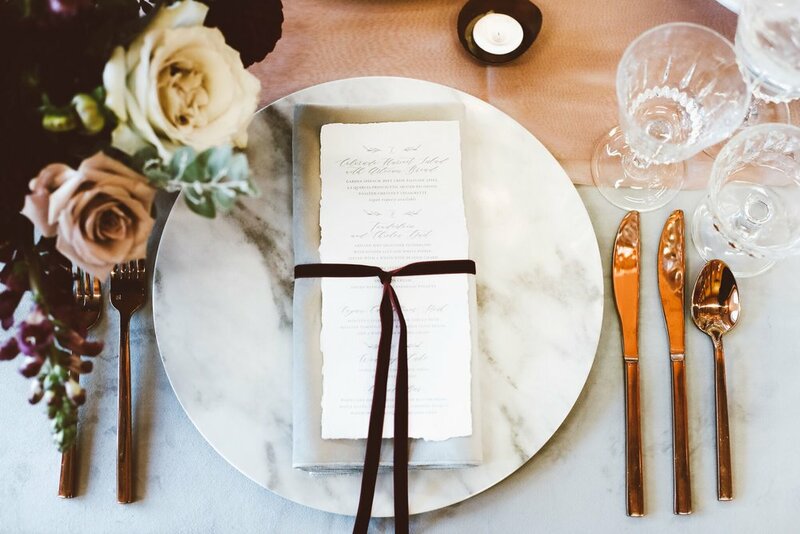 We love the clean color palette and straight lines that were so prominent in this era. 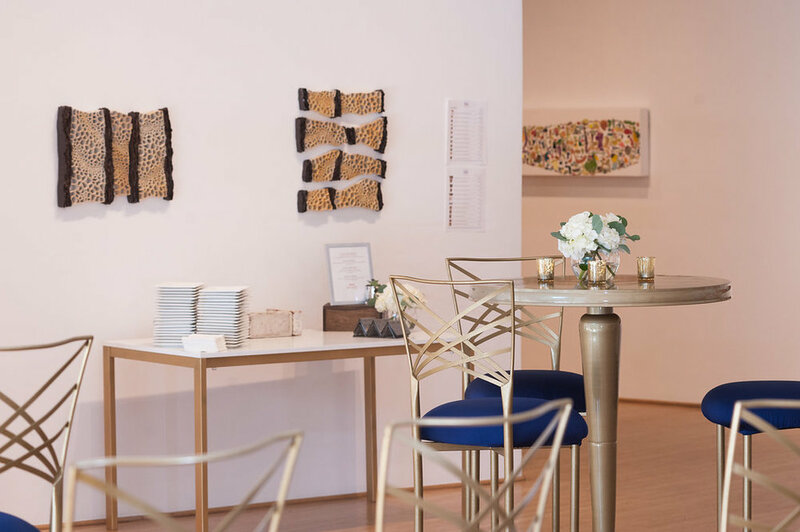 The highlight of the decor was a beautiful custom made bar paired with gorgeous gold bar stools. 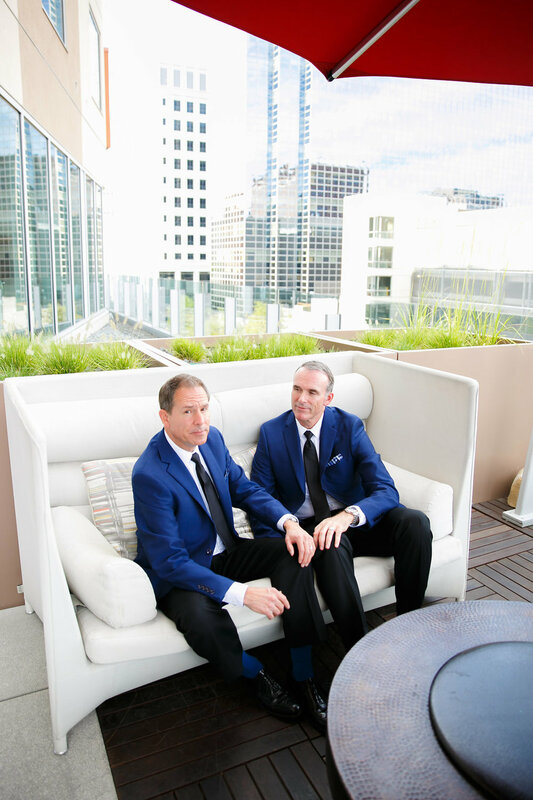 A stunning lounge anchored by a luscious blue velvet couch allowed guest to mingle in style. 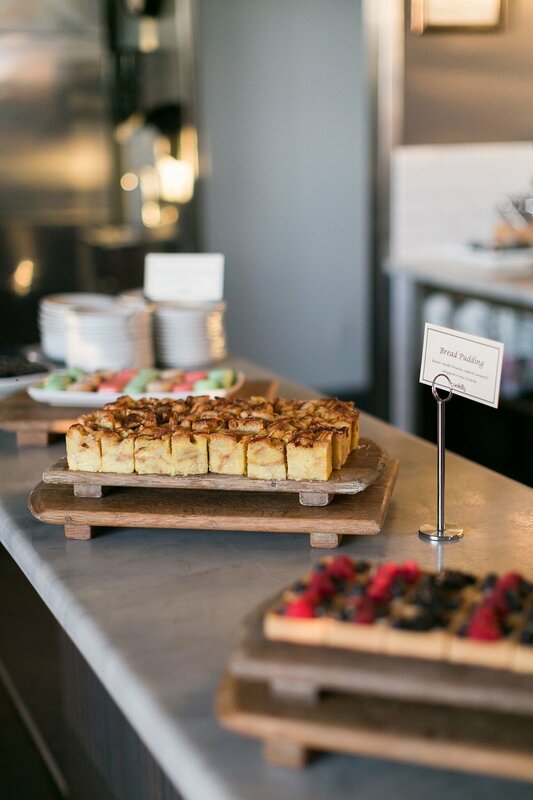 We also gave a nod to the era through the delicious food including deviled eggs, chicken and biscuits and shrimp shooters!